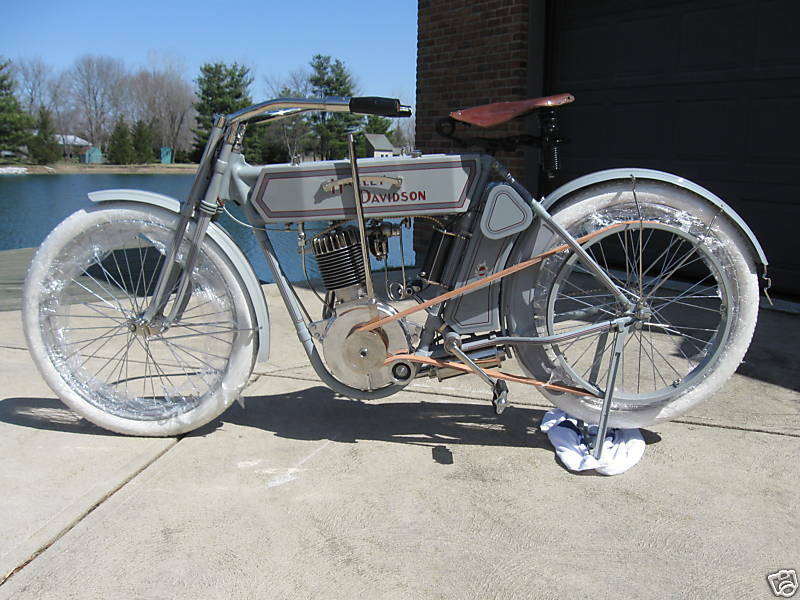 1911 Harley Davidson Model 7A Harley Davidson Belt Drive Single. 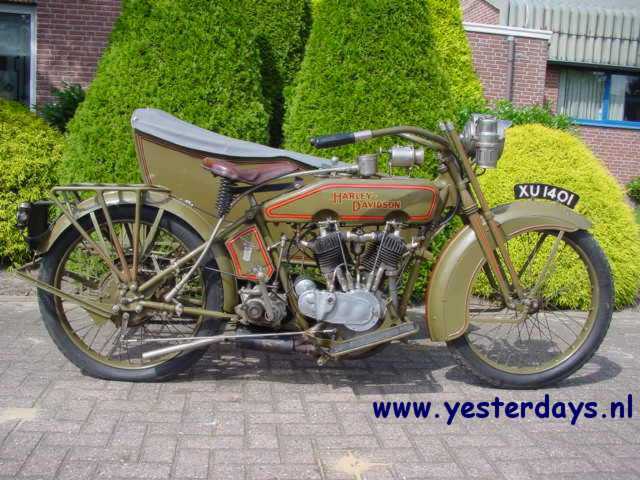 1915 Harley-Davidson 11J, 989cc Vintage Harleys all look pretty much the same to the casual beholder, but to the enthusiast a 1915 model is outstandingly interesting: it combines some features of the veteran period such as the angular petrol tank and the pedals, with modernities as a three speed countershaft gearbox and electric lighting. 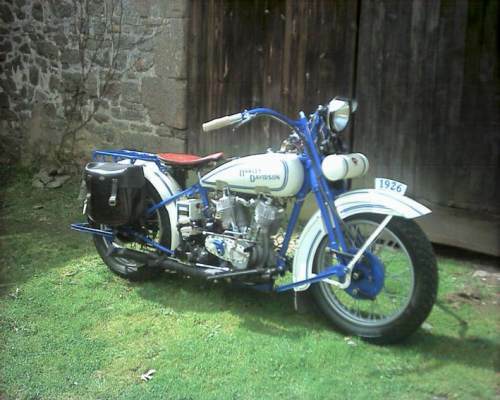 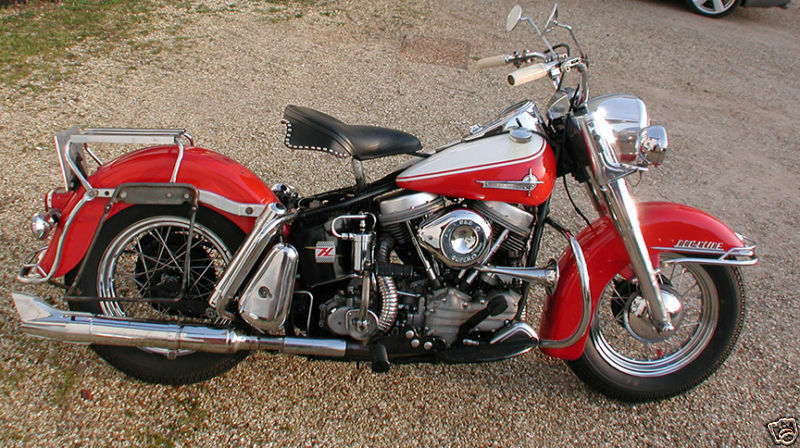 What makes this particular motorcycle even more attractive is its fabulous unrestored condition: most of the original paintwork and nickel are still prominent on the machine, which must have had some very careful owners. 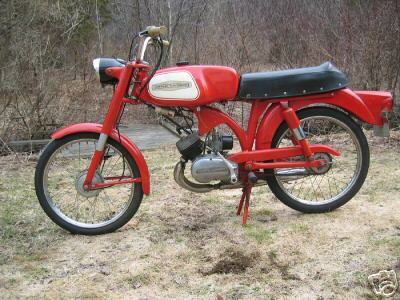 A very authentic machine, equipped with period Corbin speedometer. 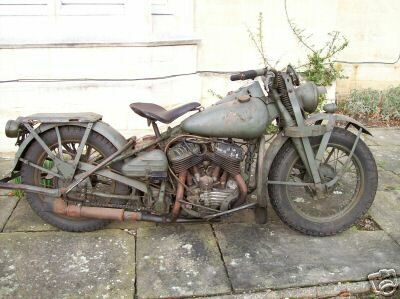 Rare post-WWI bike. 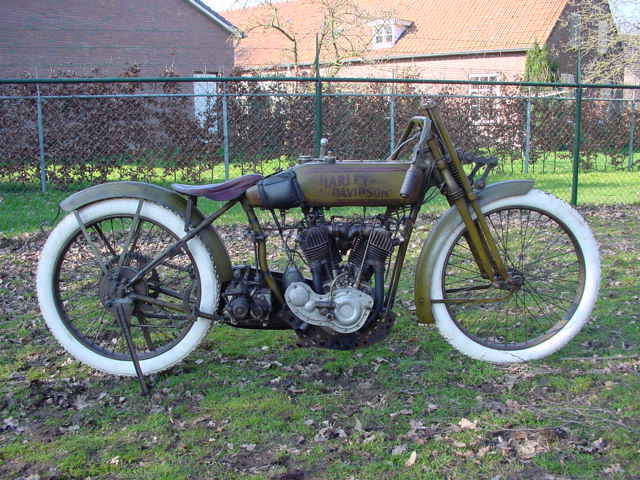 This 1919 is a 2 cylinder J Model. 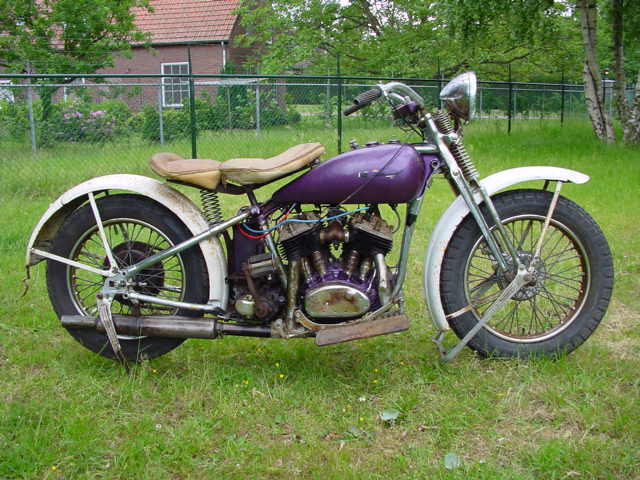 It is all original and is restored right down to the hugo horn. 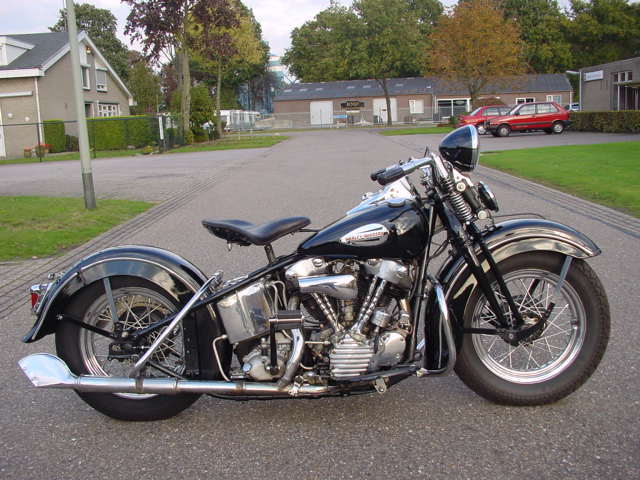 The cylinders, head light, tail light, rods, push rods and some other parts are nickel plated. 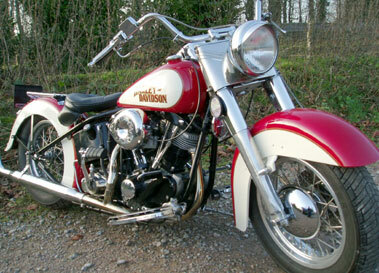 The Harley emblem is hand painted. 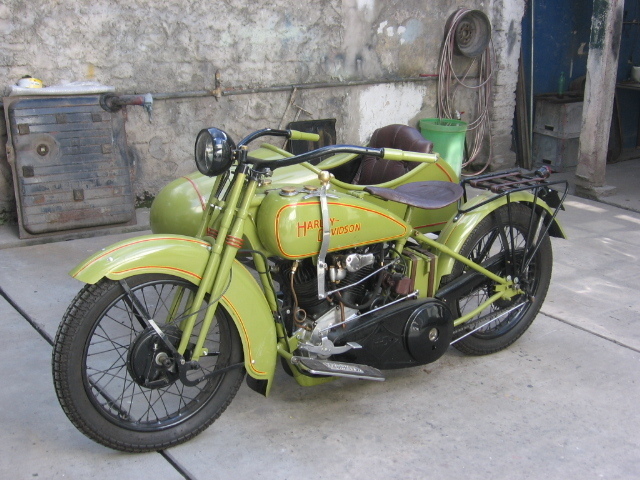 The bike is painted in original draft green colour. 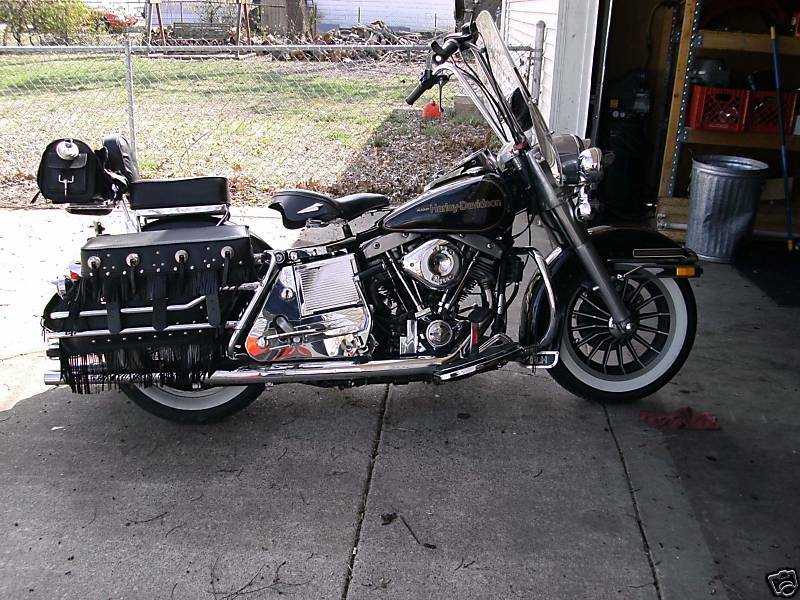 This bike has two seats. 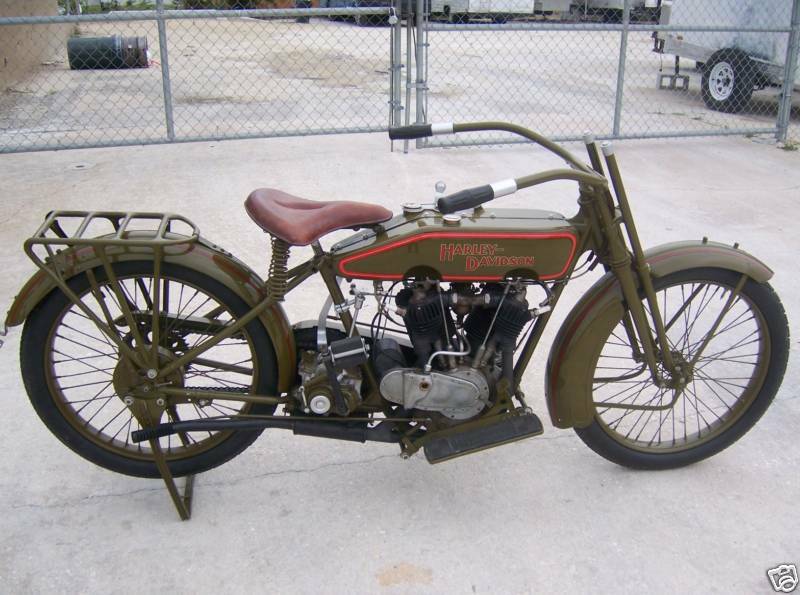 It has a 1919 Pennsylvania license plate. 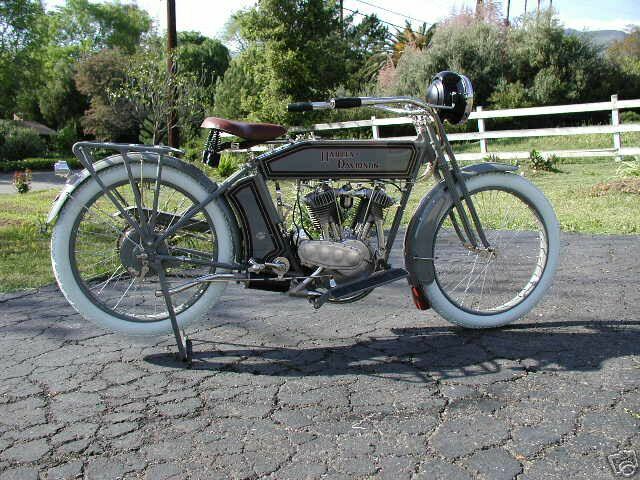 1920 Harley Davidson This Harley Davidson is a prototype designed by Cometa restorations.. this inspired one is the Harley Davidson KR Fast Roadster 1915. 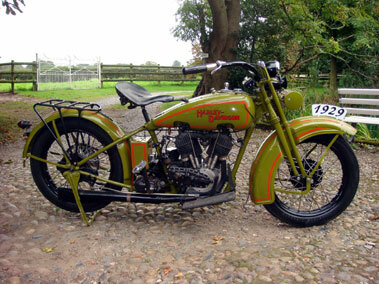 1921 Harley-Davidson 21-FS, 989cc Although this machine was manufactured in 1921, it was actually only sold in Britain in 1924. 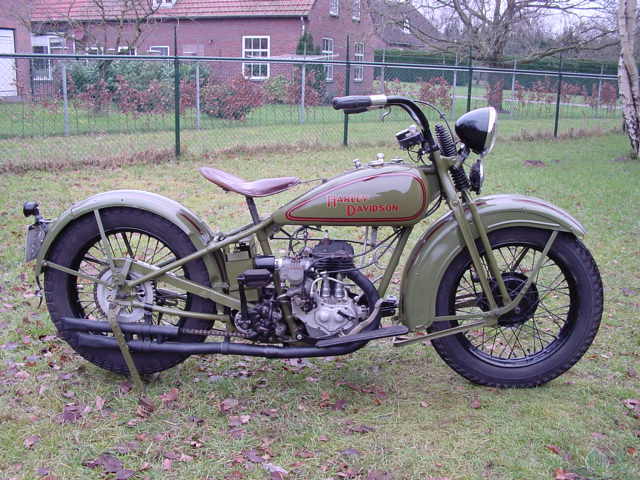 In the twenties it was customary that Harleys that were imported in Britain were equipped with British-built sidecars, lighting systems etcetera. 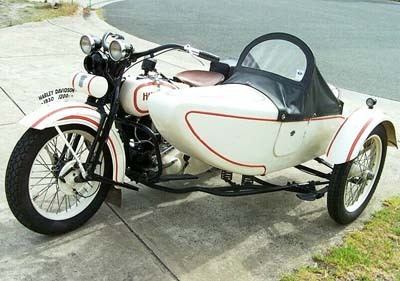 Hence the non-factory sidecar and Lucas acetylene set. 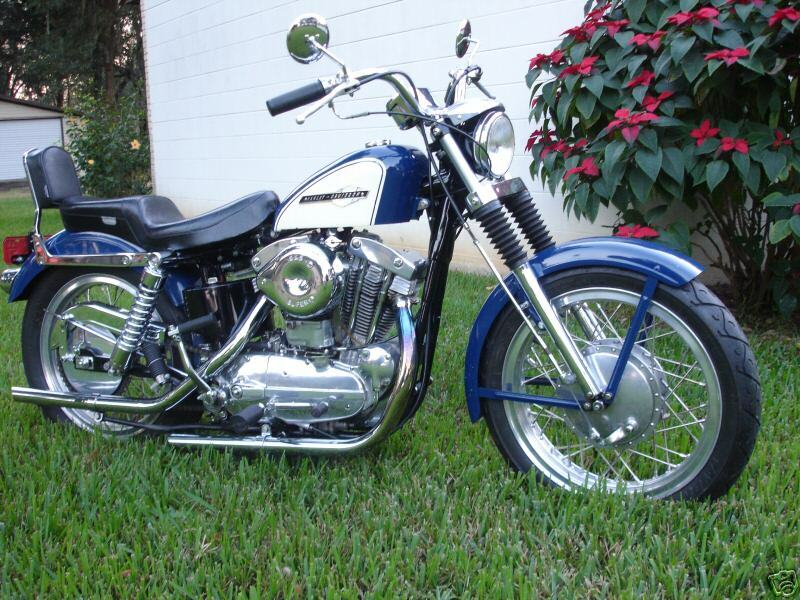 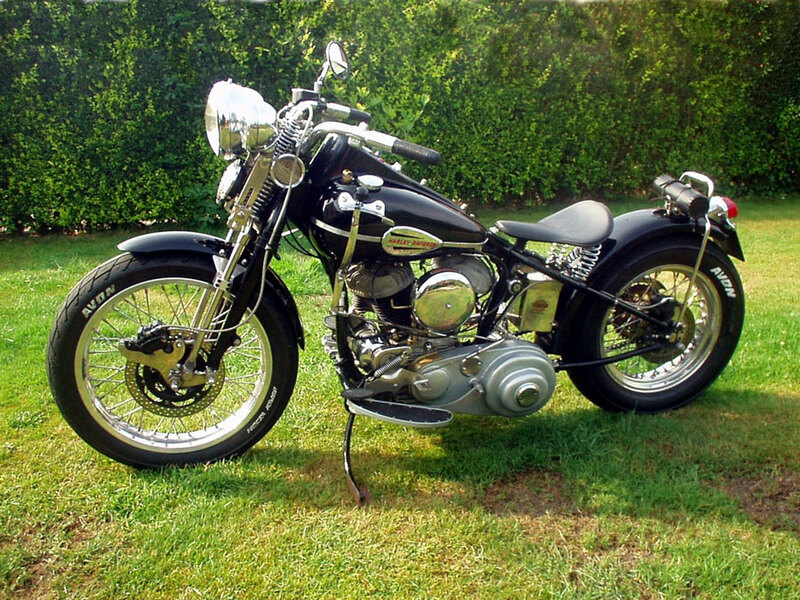 This nicely restored vintage HD comes complete with Corbin speedometer and genuine British top-tube mounted horn. 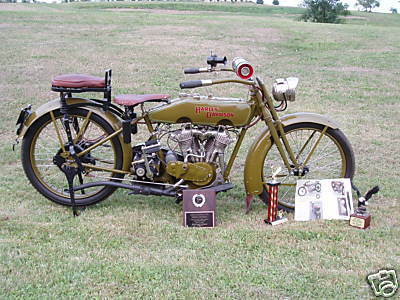 This racing model was built from 1914 to 1924. 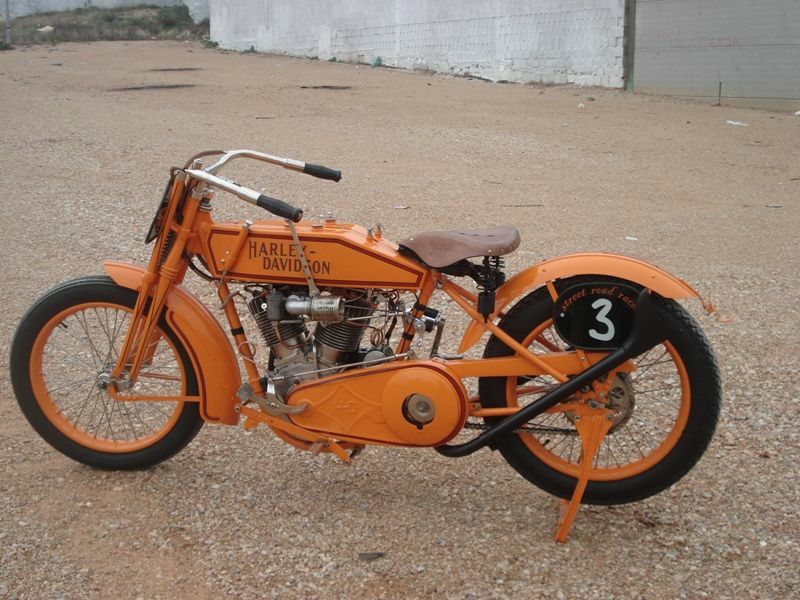 1923 Harley-Davidson 23-F, 989cc It took the Harley-Davidson Co. about 12 years to develop their motorcycles from a single cylinder belt driven single 3 HP machine to the 45 degree V-twin with 3-speed countershaft gearbox that was marketed in 1915. 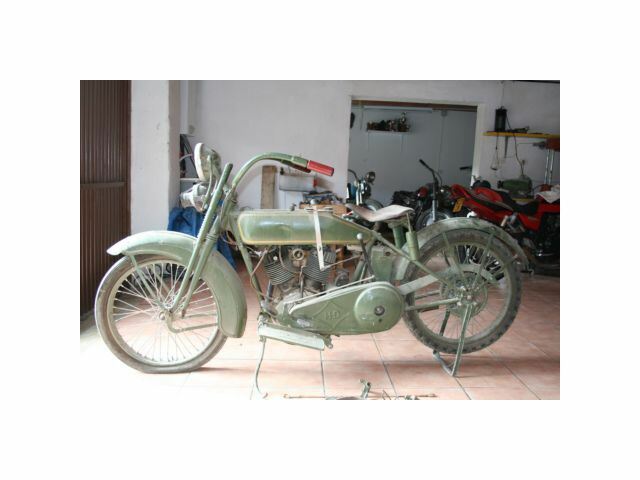 This sturdy 989 cc (84x89mm) machine became a popular choice for motorcycle buyers all over the world, private enthusiasts as well as police forces, postal sevices and other government bodies. 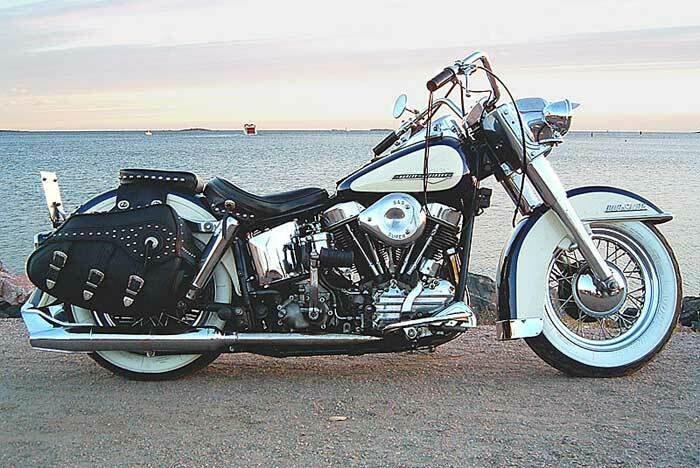 The OHV inlet, side valve exhaust concept was used till 1930, when HD chose the full sidevalve engine concept. 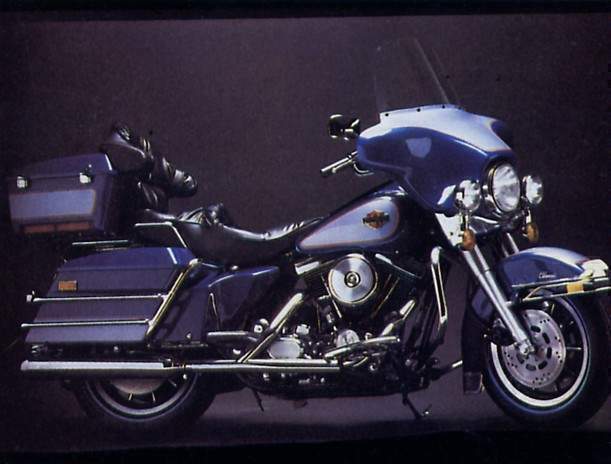 HD’s became famous for their power, comfort and reliability. 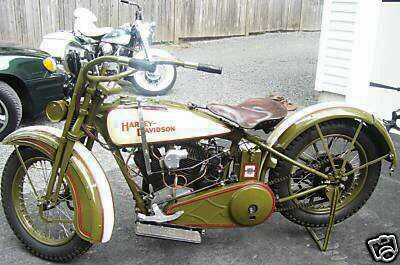 1923 Harley-Davidson JD 1000cc V-Twin. 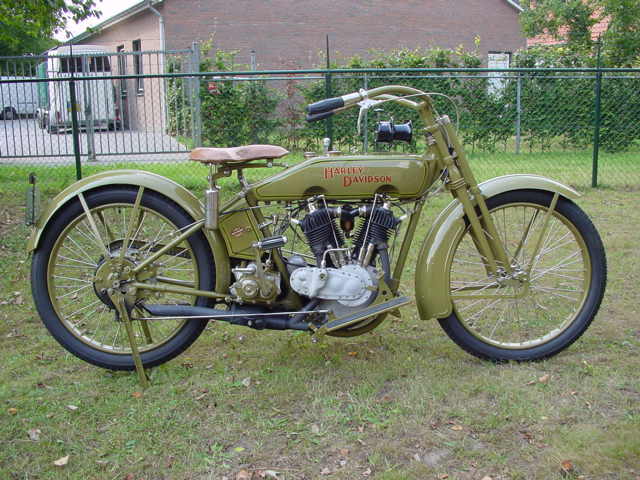 1925 Harley-Davidson 25-FDCB, 1212cc In the early twenties a 1212 cc version (bore x stroke 87.4x101.6mm)was brought out. 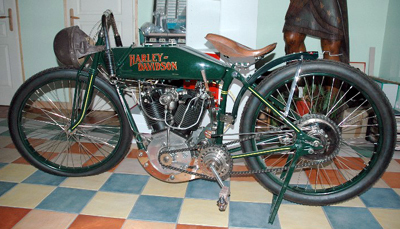 With this model the machine weight grew from 366 lb in 1924 to 420 lb in 1929. 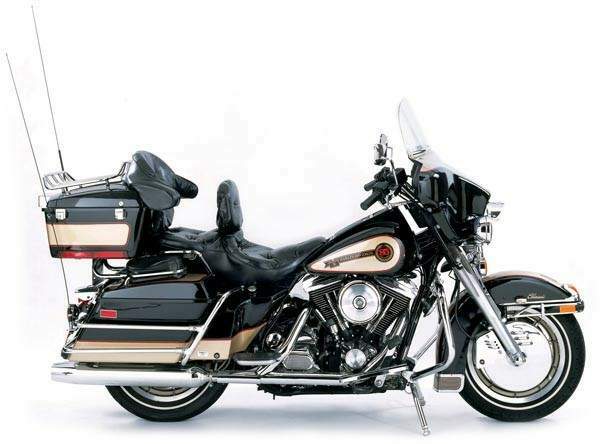 HD's became famous for their power, comfort and reliability. 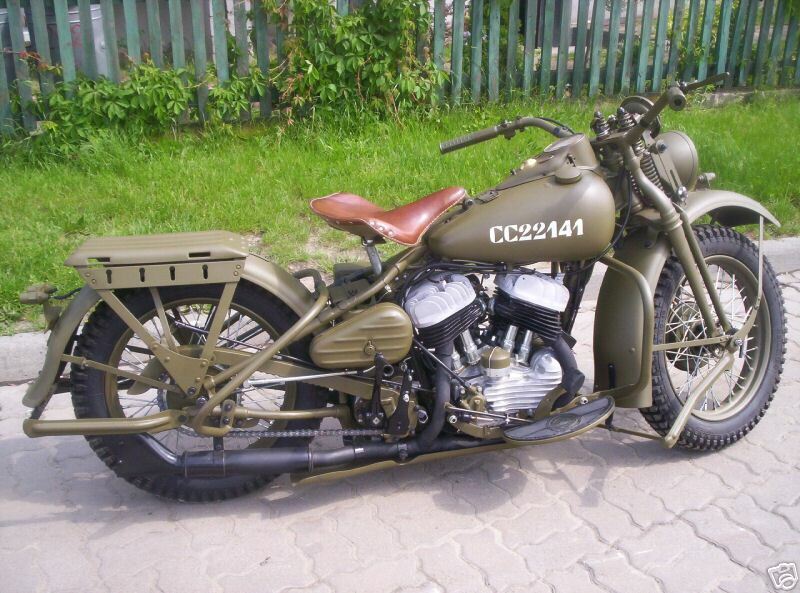 There is still magic in the name, just as it was 75 years ago! 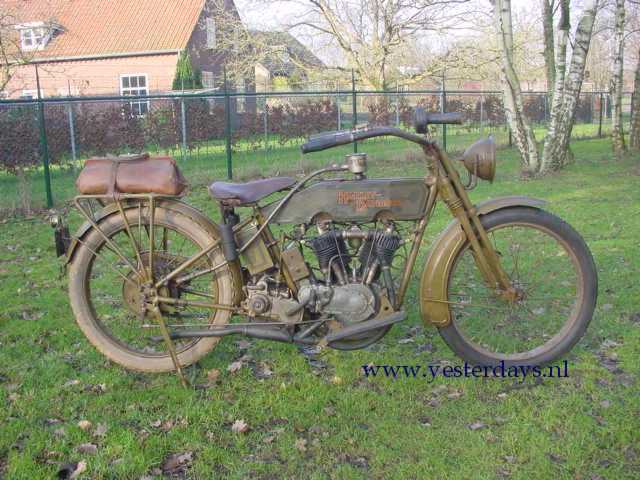 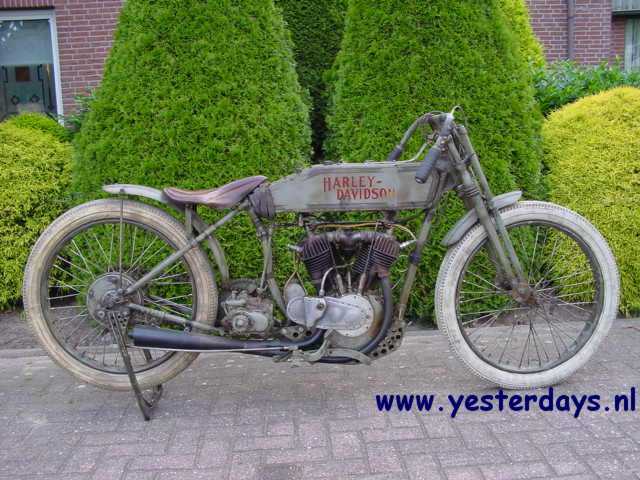 1926 Harley-Davidson 26-B, 350cc 1926 Harley Davidson 26B 350cc s.v. 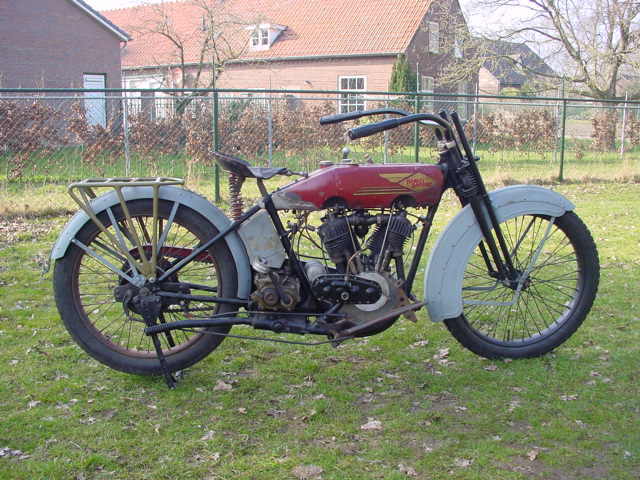 Model twenty one was introduced in 1925 and it was mainly produced for the export market; it was the lowest price Harley at the time. 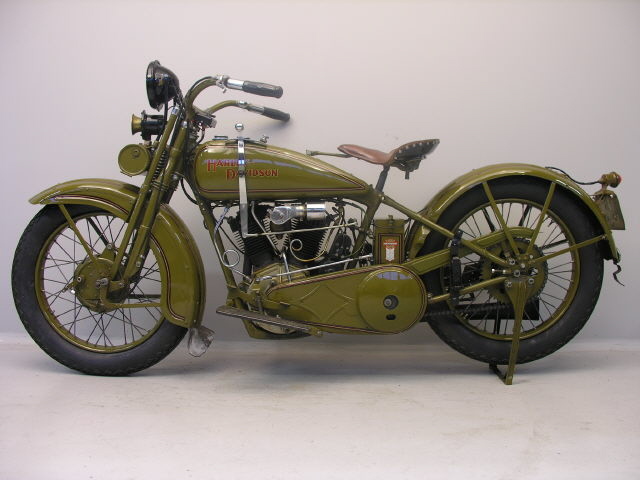 This model B is the luxury model with full electric lighting. 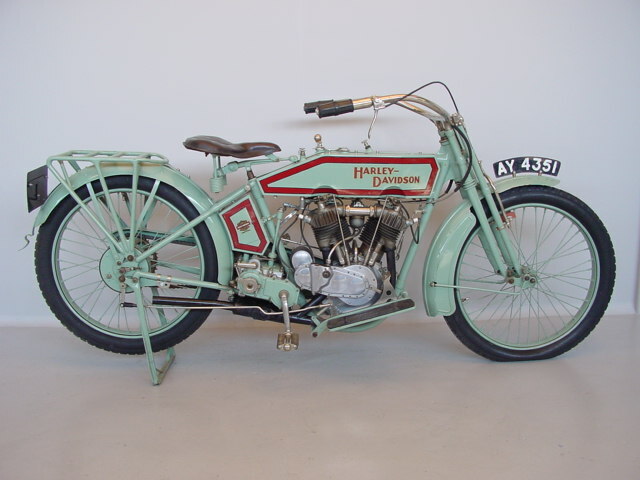 1928 Harley-Davidson 28-B, 350cc Model 28-B was introduced in 1925 and it was mainly produced for the export market; it was the lowest price Harley at the time. 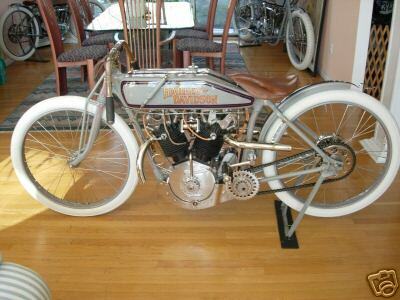 This model B is the luxury model with full electric lighting. 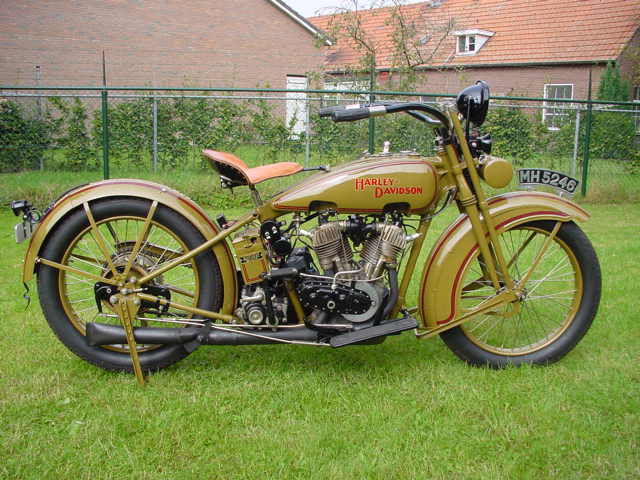 1928 Harley-Davidson 28-JDH, 1200cc There was a 61 ci ( 1000 cc ) JH version and a 74 ci( 1200 cc ) JDH model. 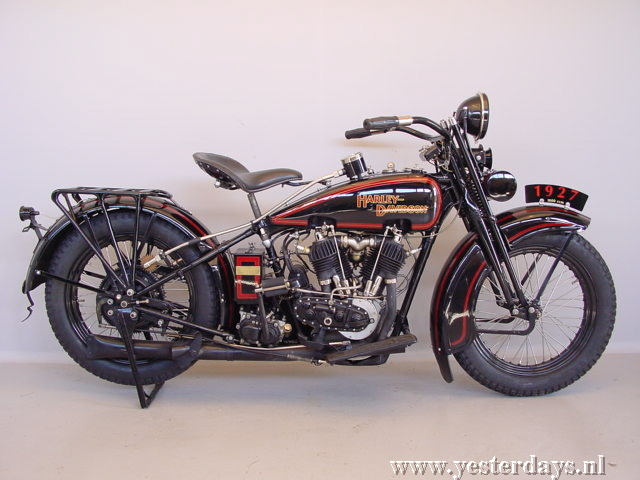 The timing gear case had a distinctive peanut shape, which made it easily recognizable as a Two Cam. 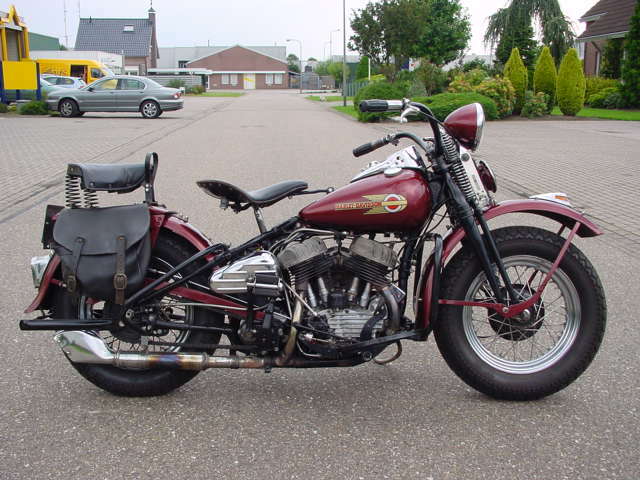 The Two Cams used a direct action valve gear; the machines were very fast and differed in a number of respects from standard models: fuels tanks were narrower, front forks were specially forged and the wheels were 18 in diameter instead of 20. 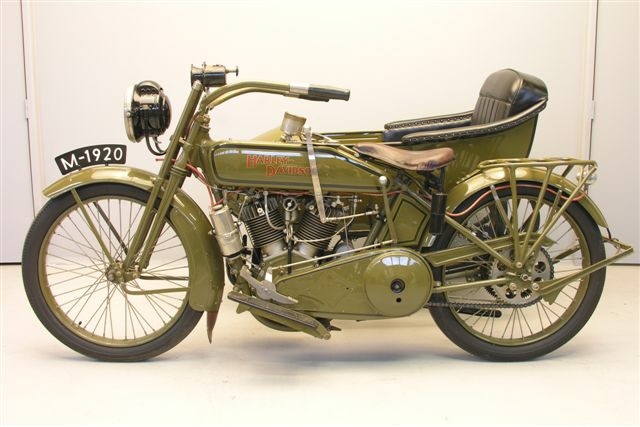 The first of the 60.3 cubic inch J series twins appeared in 1915, offering 60 mph performance and the luxury of electric lights. 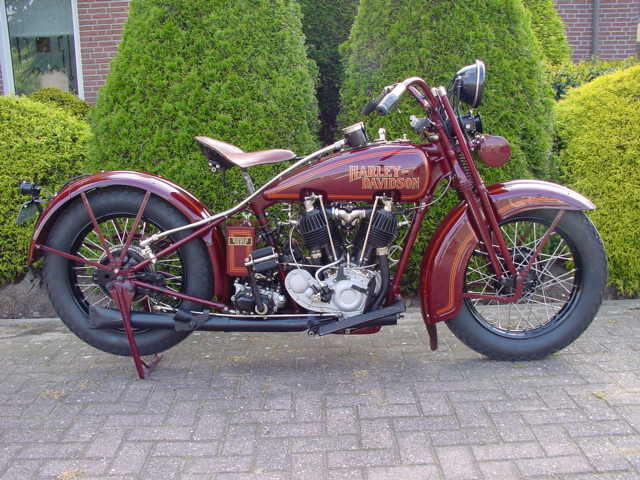 A comprehensive mechanical redesign occurred for the 1920 and was followed by the adoption of a new frame design for 1925 whilst styling and mechanical refinements appeared with each season launch. 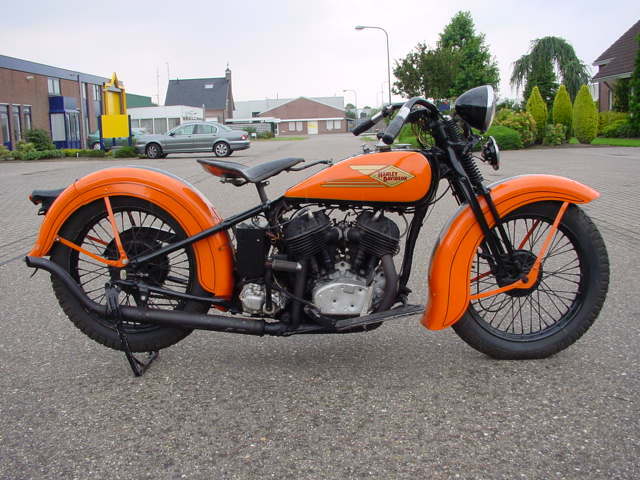 By 1929 when this example was built, Harley Davidson were fitting a front brake as standard to their machines and offered five versions of the "61" including a specialist sidecar model and a sports variant with narrower tanks and smaller tyres. 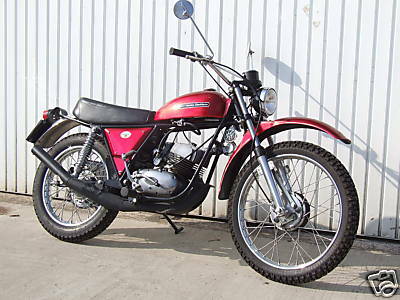 The machine offered is an example of the standard J model which utilised the 17 bhp motor. 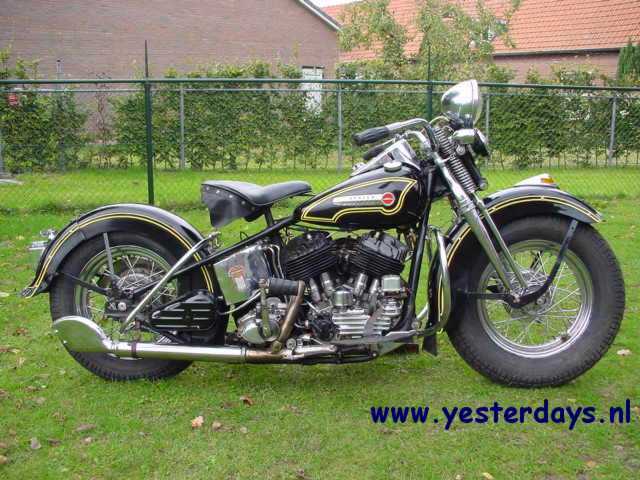 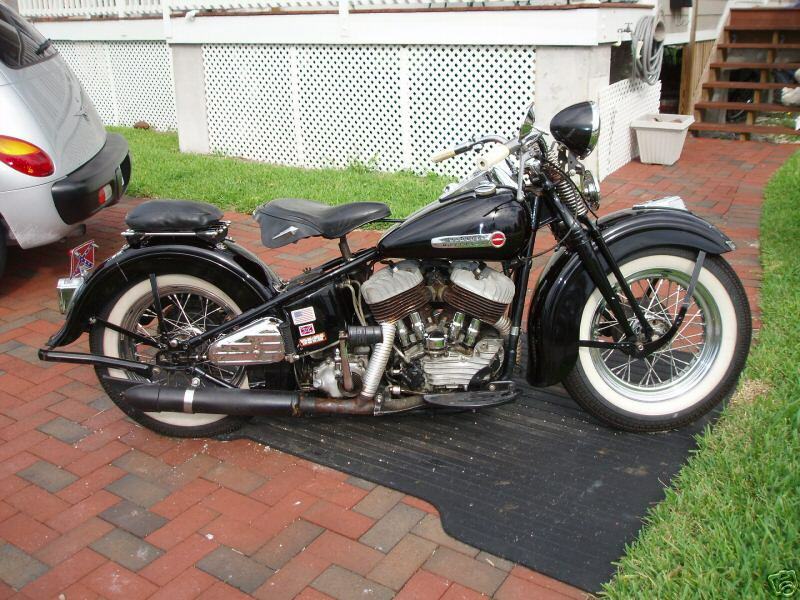 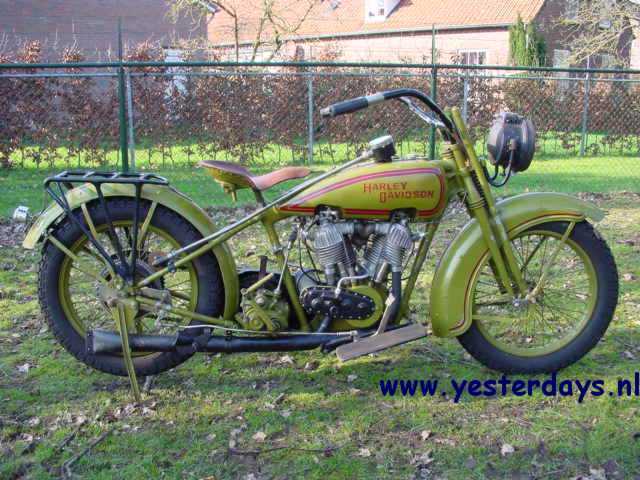 1931 Harley Davidson C-Single This was a proven Harley Davidson with real racehistory. 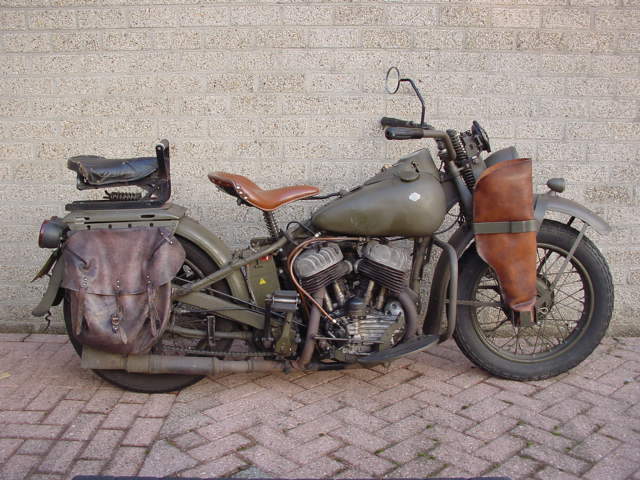 Board Tracker Single in the 1930's. 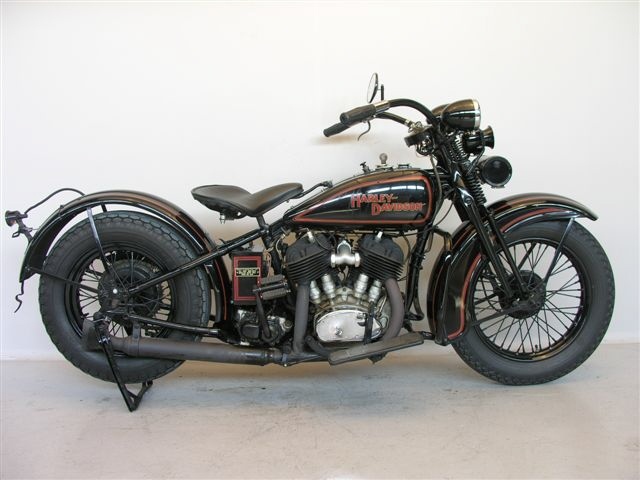 1931 Harley-Davidson 31-V, 1200cc Model 31-V Solo 74ci medium compression flathead V-twin with three speed transmission. 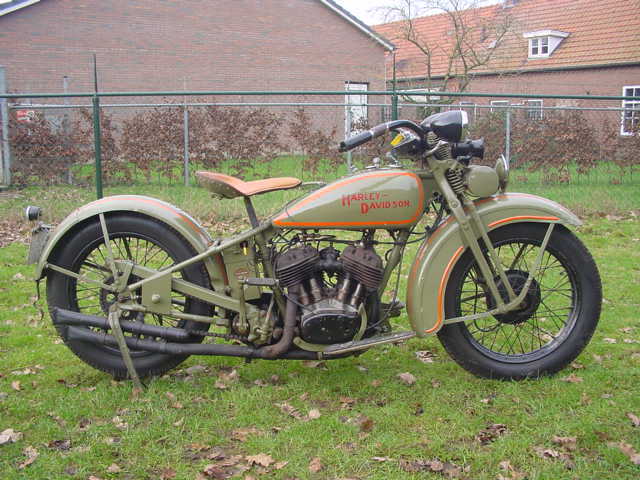 1932 Harley-Davidson 32-B, 350cc The 350cc model was the cheapest model from the HD range. 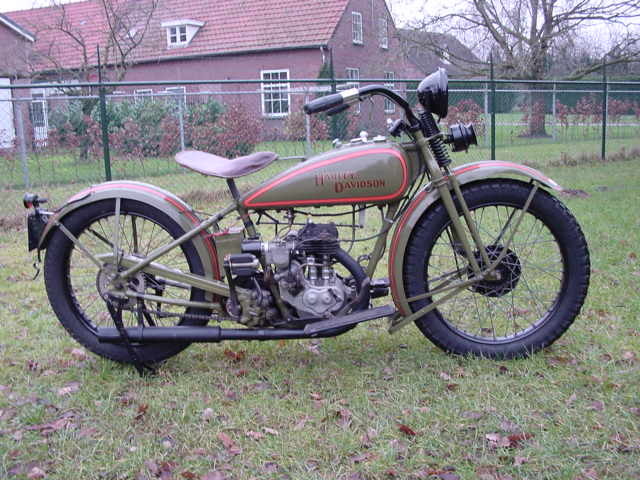 During the depression years it was a popular choice for people who wanted reliable and cheap transport. 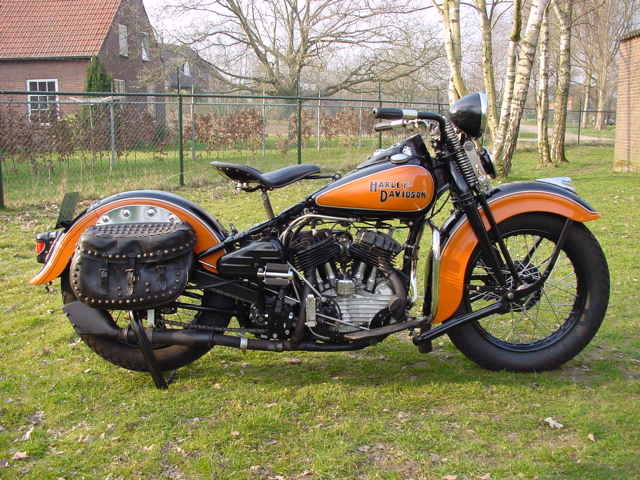 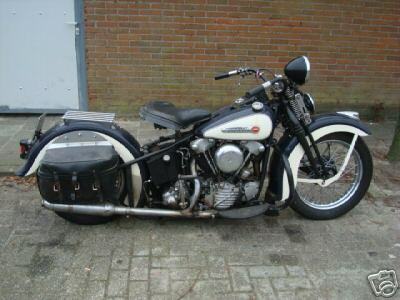 1932 Harley Davidson R32 750cc. 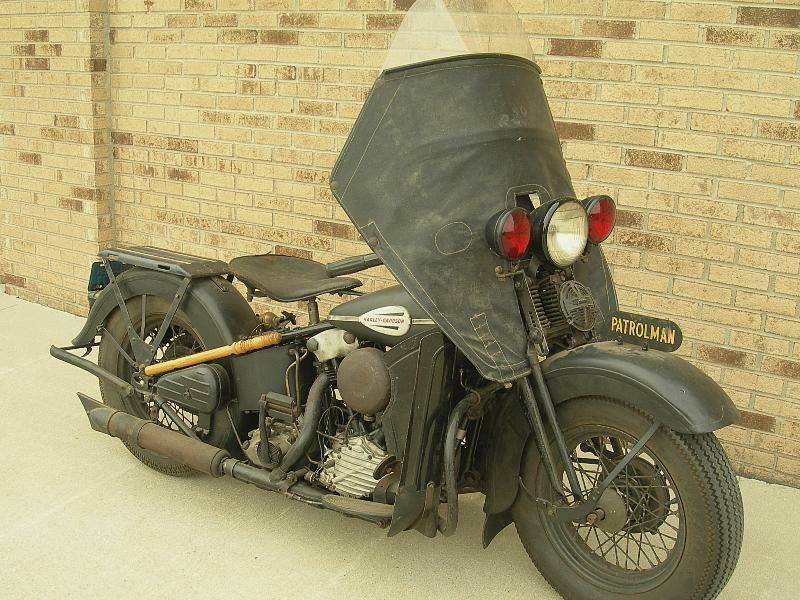 1935 Harley Davidson VD This is an ultra-rare 1935 police bike with sidecar. 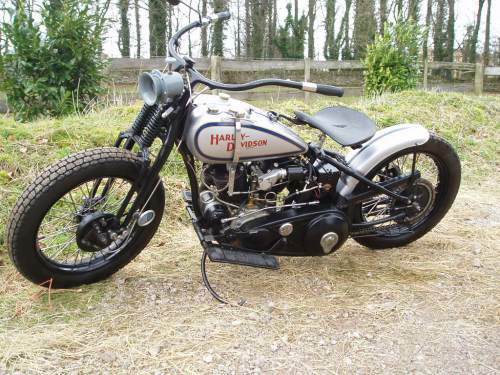 1936 Harley Davidson VLH 1340cc, 32bhp. 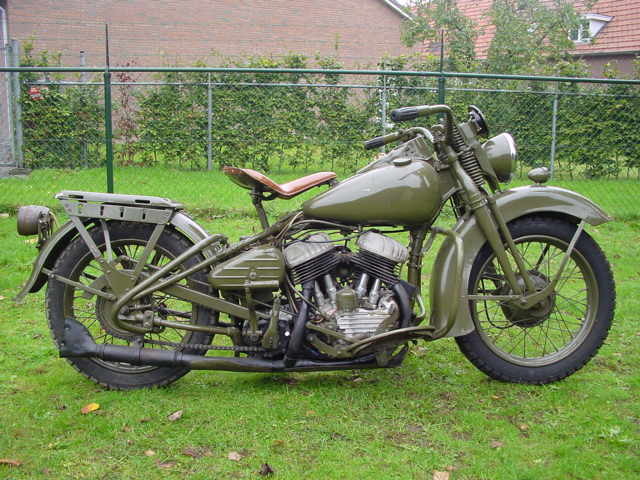 1940's Harley Davidson Side Valve Harley-Davidson side valve, genuine WWII machine in its original unrestored condition. 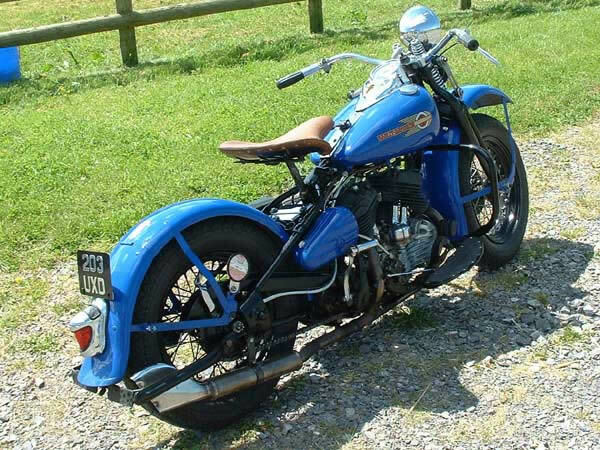 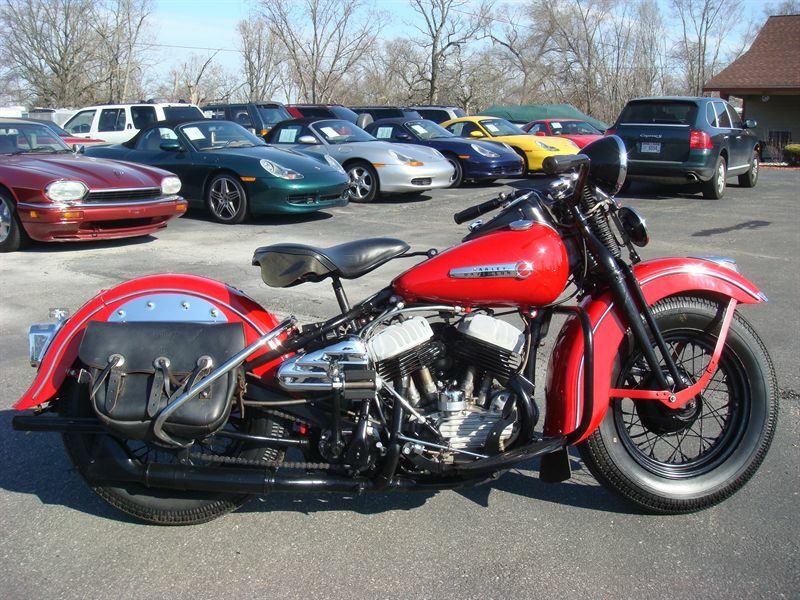 1940 Harley-Davidson 40-EL, 989cc Model E Knucklehead - named after the shape of the polished aluminium rocker shaft covers- was a slow success for Harley. 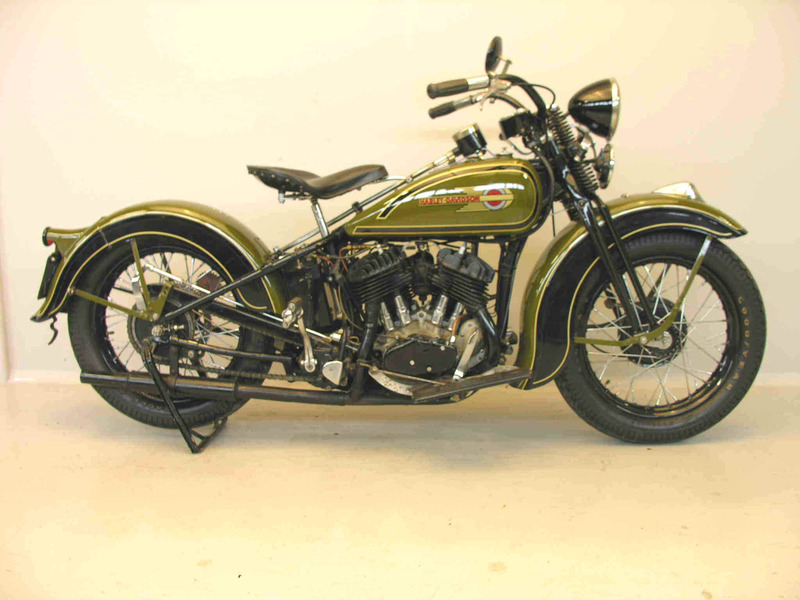 They sold just 152 of them in 1936, out of a planned production of 1,600; and only 126 in 1937. 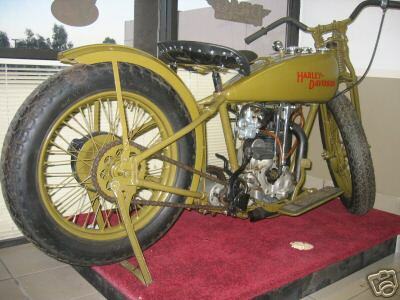 Then, in April 1937, Fred Ham, a Pasadena motorcycle police officer took his own, carefully-broken-in Model E to Muroc Dry Lake (now known as Edwards Air Force Base). 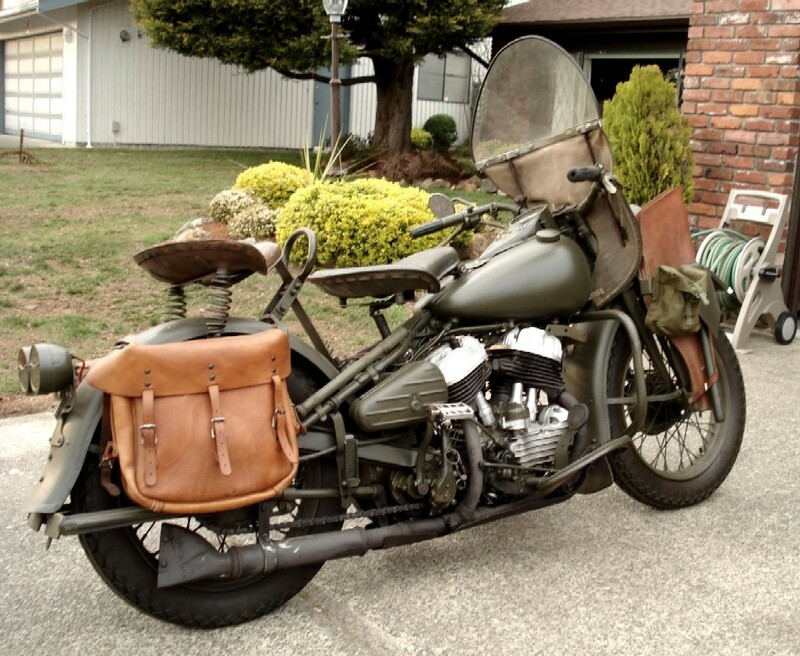 He outlined a five-mile circle with flags and flare-pots for round-the-clock riding. 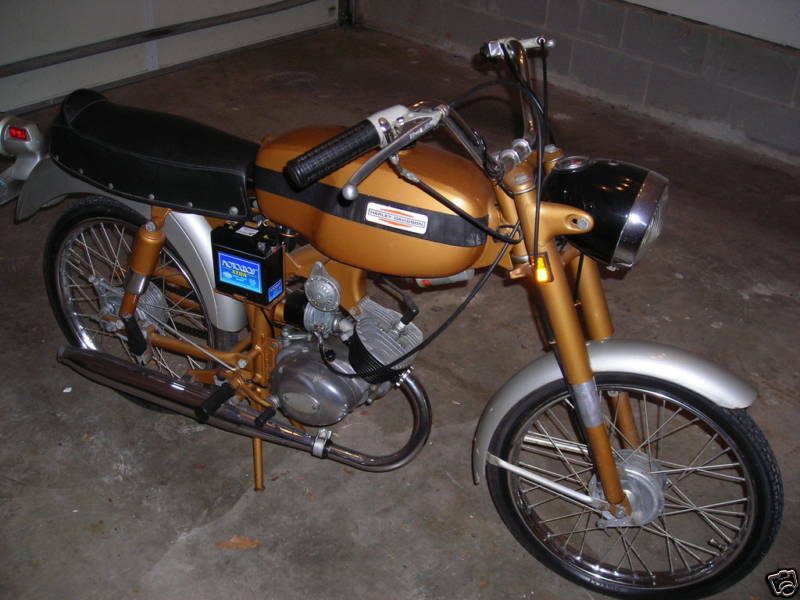 Stopping only for fuel, oil, fruit juice, and to change a broken rear chain in the 20th hour, Ham completed 1,825 miles, averaging 76.02mph. 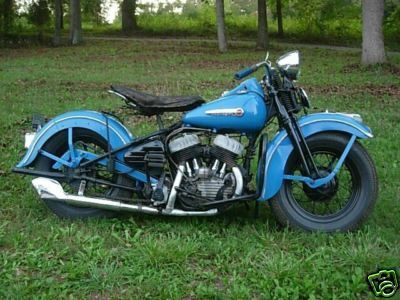 He set 43 new speed and distance records for himself and Harley-Davidson's Model E, single-handedly founding the legend of the Knuckleheads. 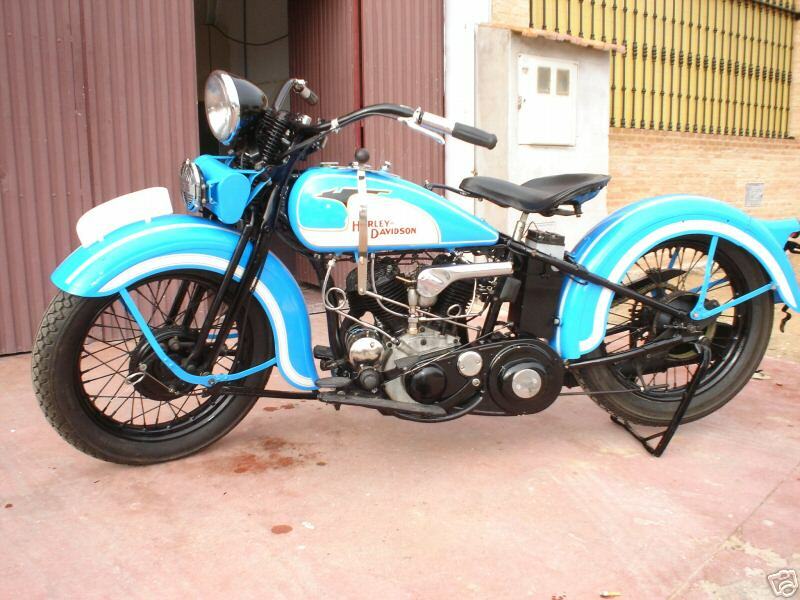 The engine has a power output of 37 HP @ 4800 RPM which gives the machine a top speed of 100mph. 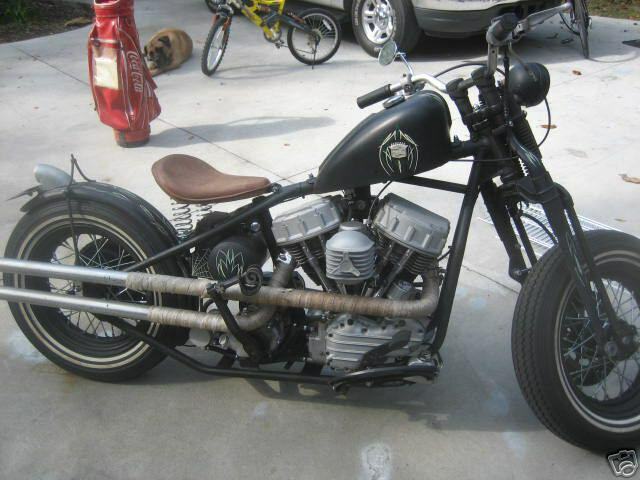 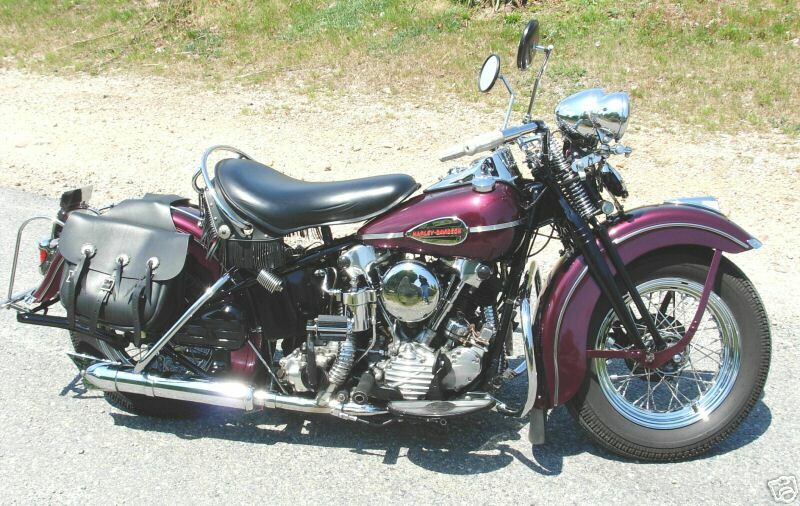 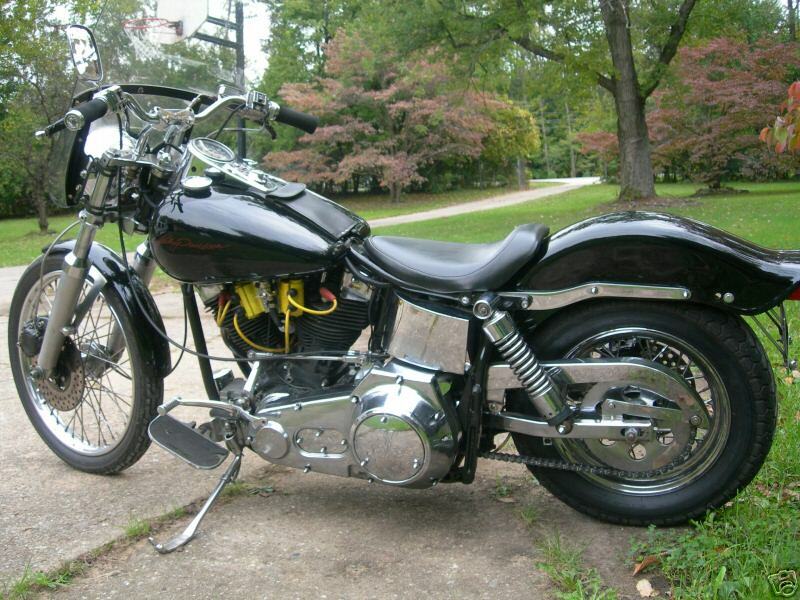 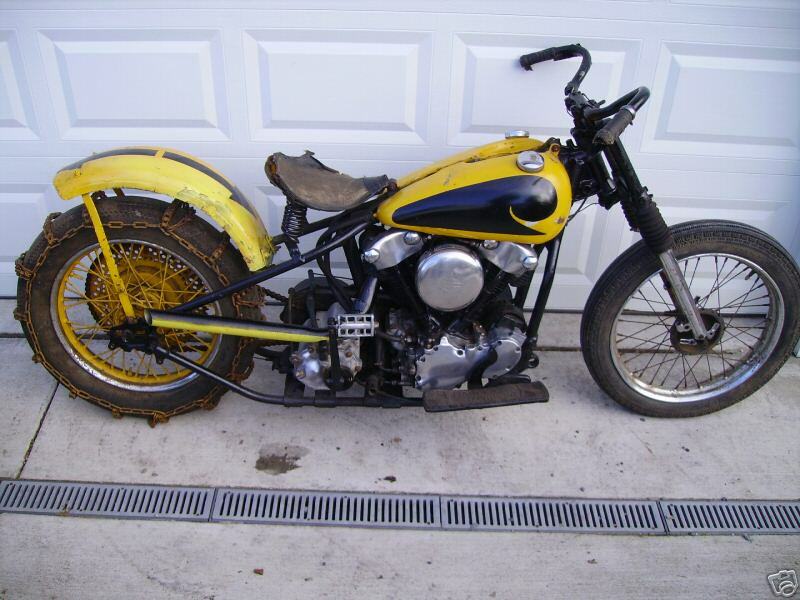 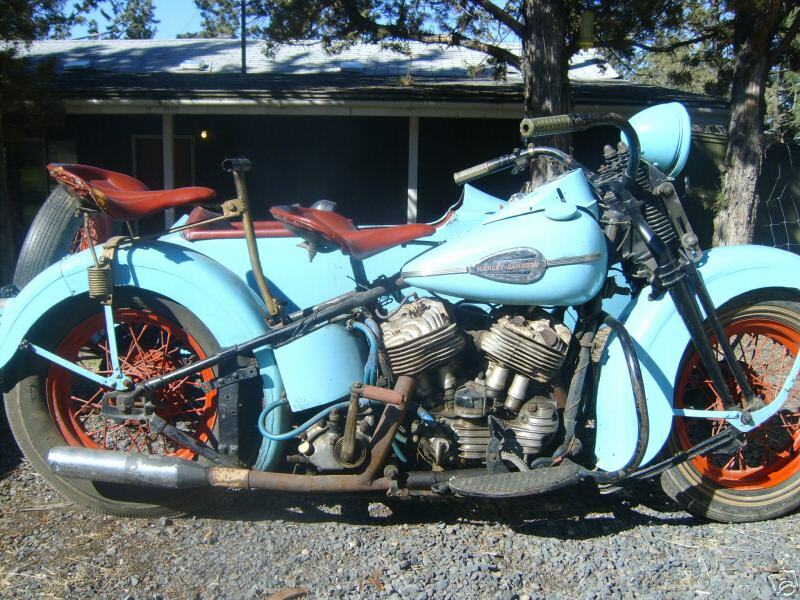 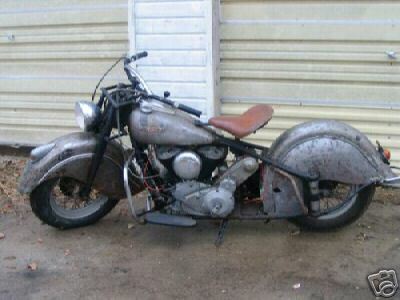 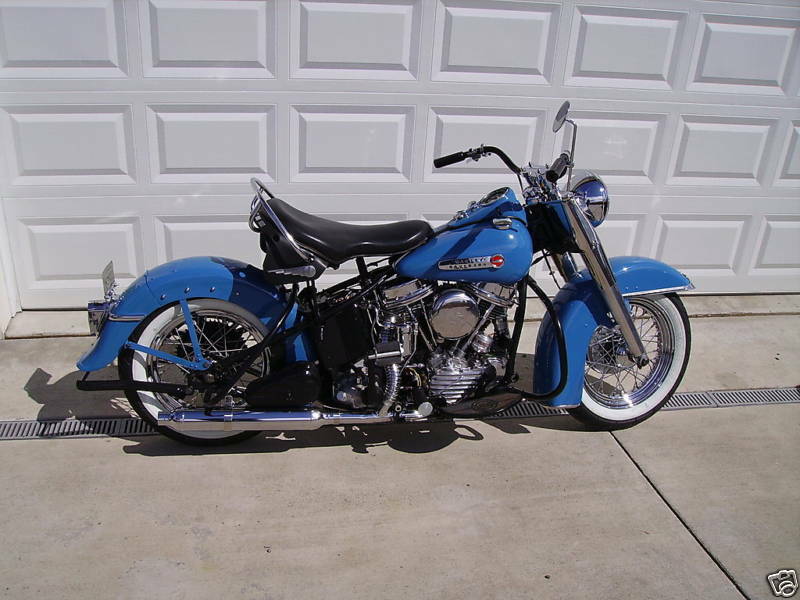 1942 Harley Knucklehead 1942 Harley Davidson, hardtail, springer. 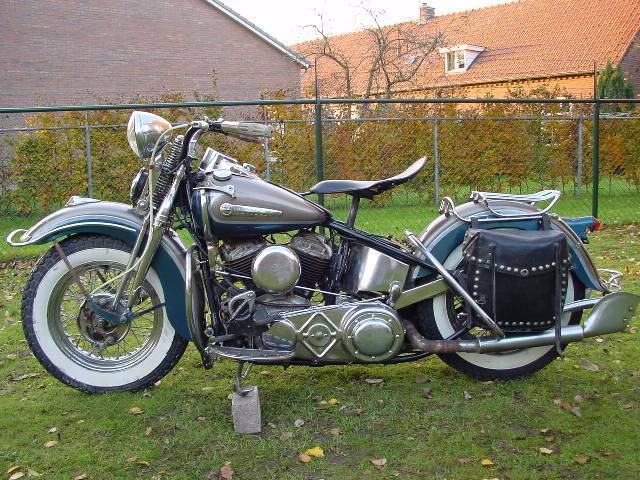 74 c.i. 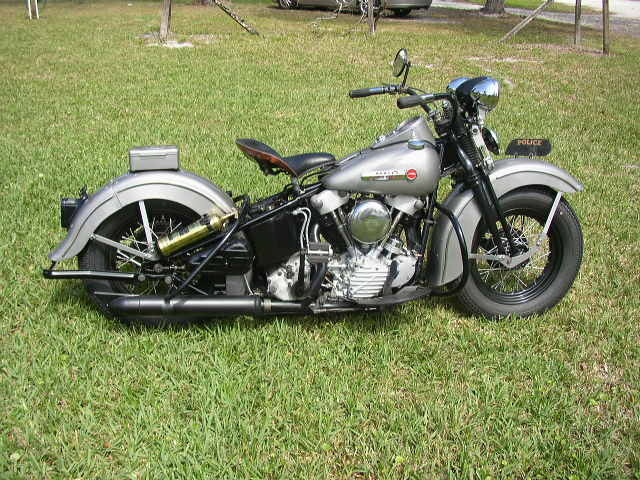 Knucklehead motor. 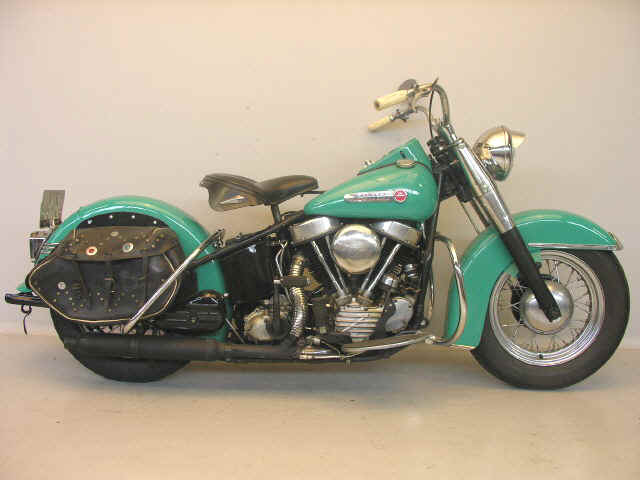 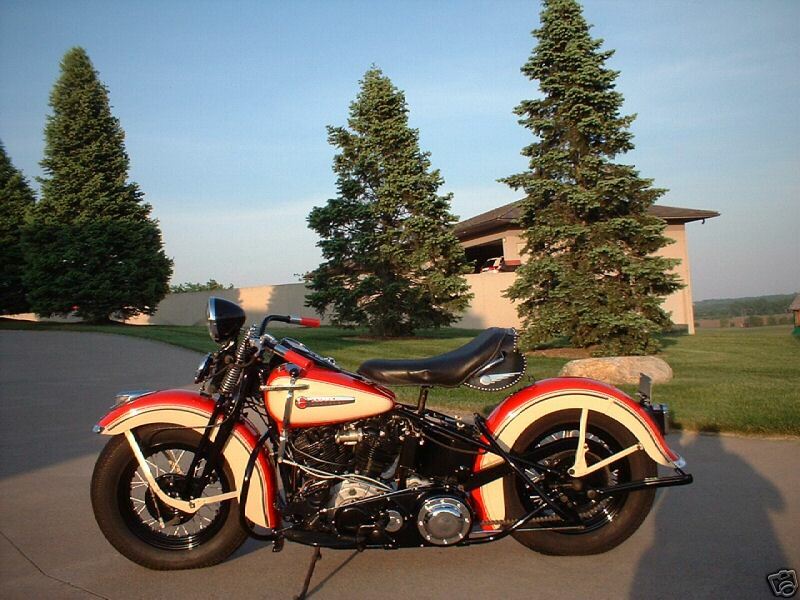 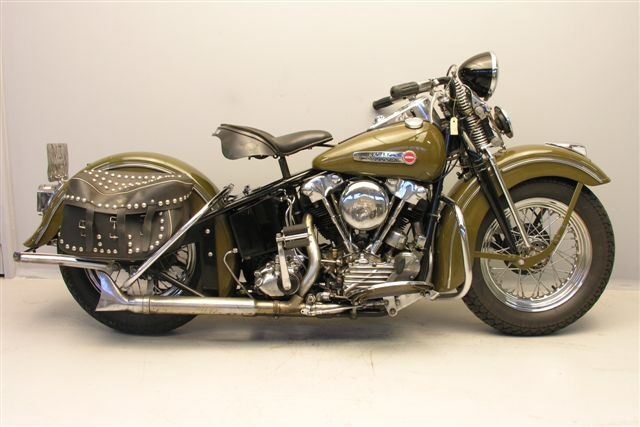 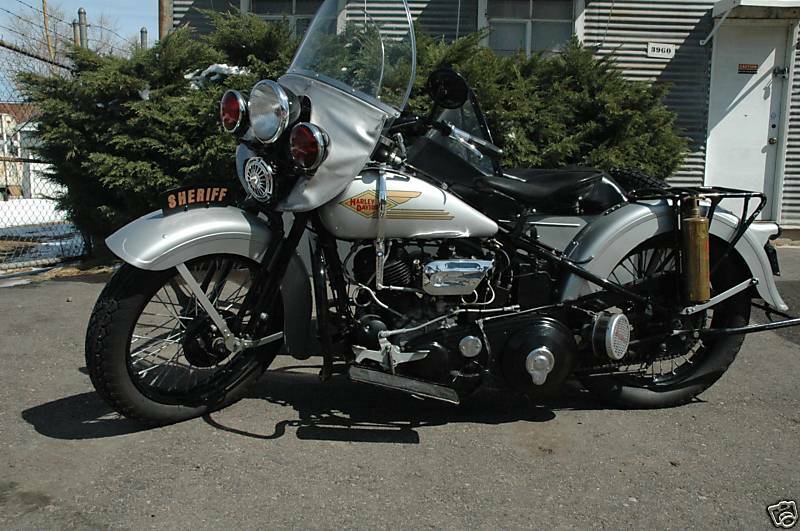 1944 Harley Davidson Knucklehead ex-Police bike. 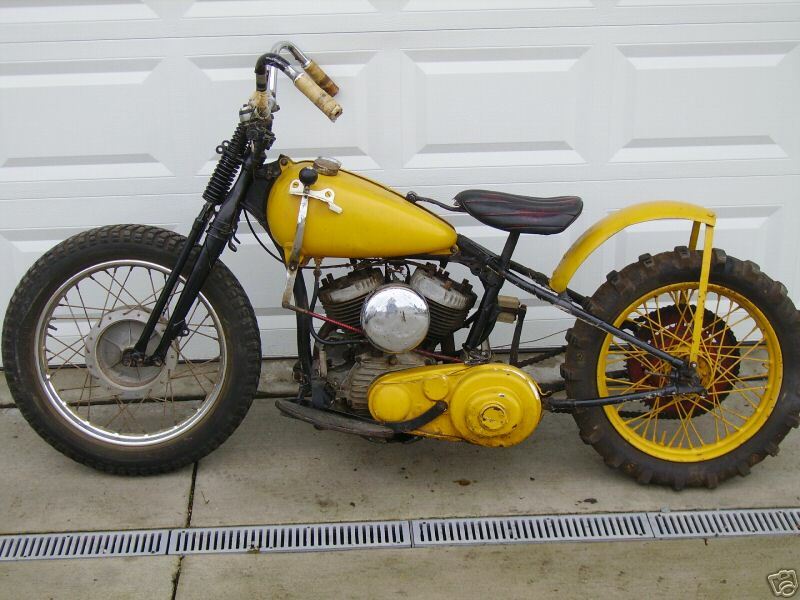 This bike was raced in Seattle area Hillclimbs in the early 1970's. 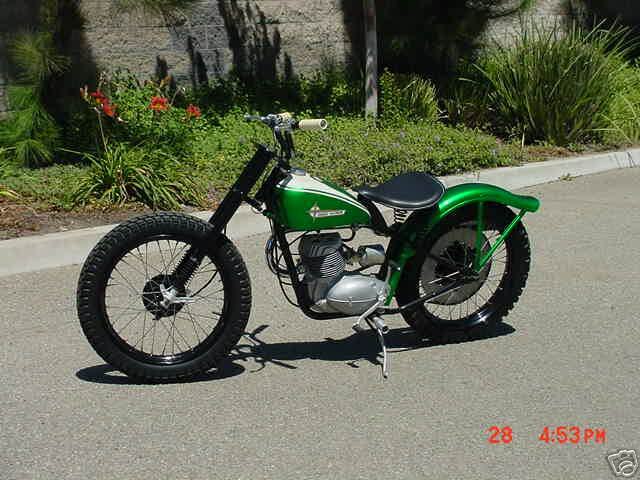 In classic hillclimber style, the bike was lightened up with a hydraulic front end and different rear fender. 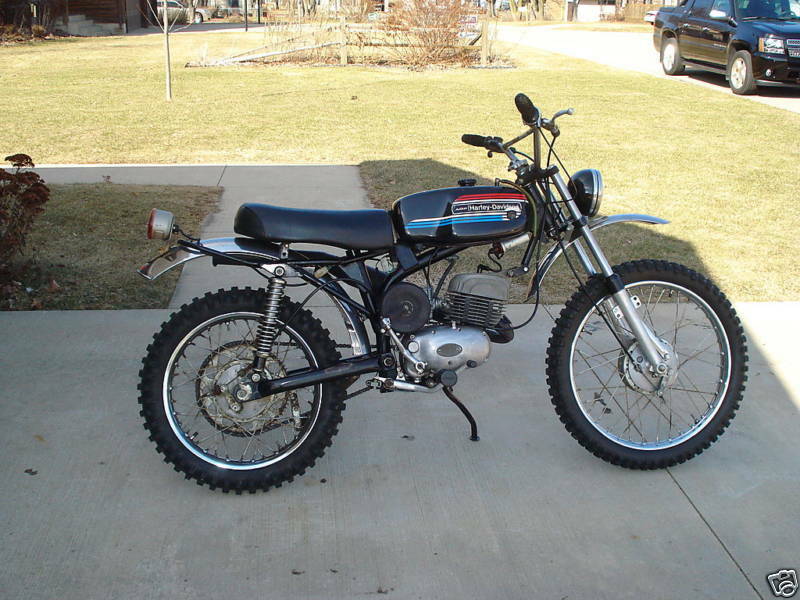 The large rear sprocket also helped to get the bike "up the hill." 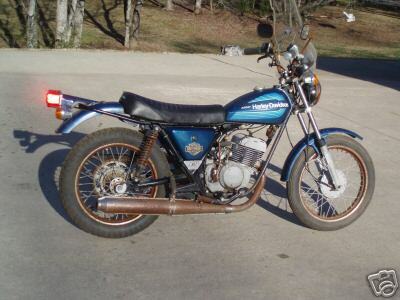 This bike still has the roller chain on the rear wheel, which was another asset in trying to get up the hill. 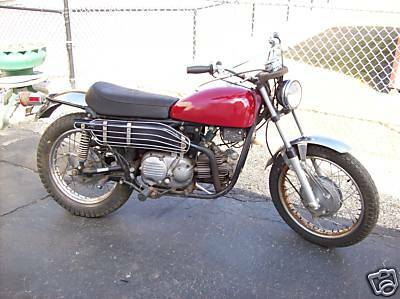 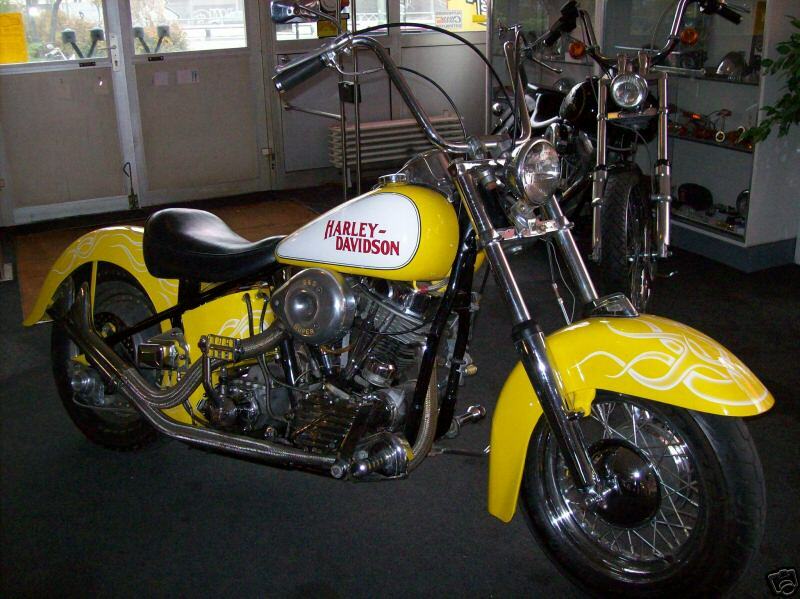 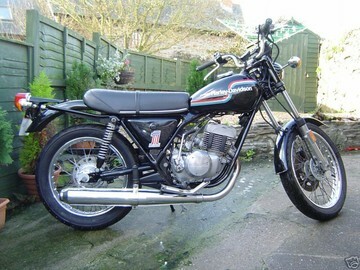 The bike was bought in 1971 from Jack Wadkins who was an expert Class C rider. 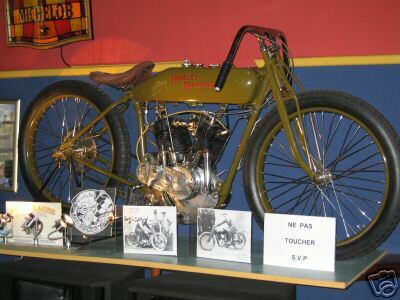 The tuner for the bike was John Martinolich who was the Class C Professional Hill Climb champion in the 40's and 50's. 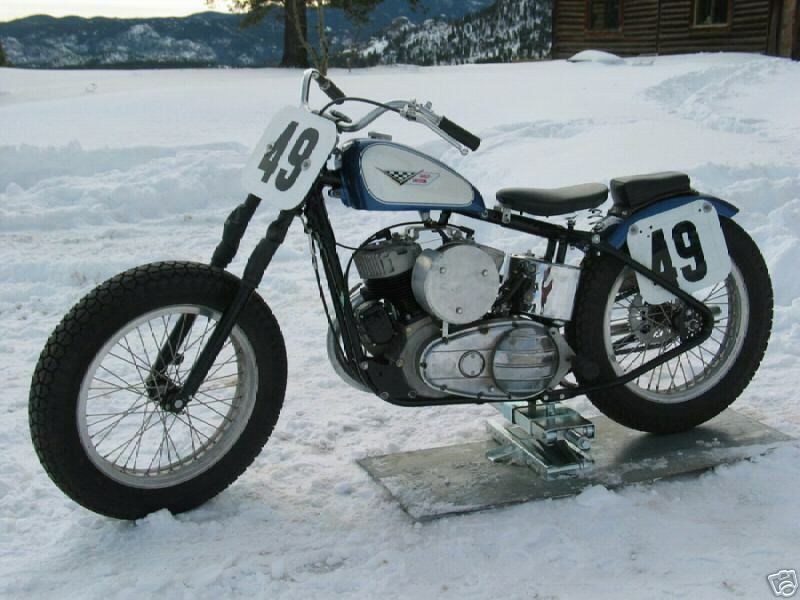 1948 Harley Davidson WR This bike was raced back in the early 1970's in Seattle area Hillclimbing events. 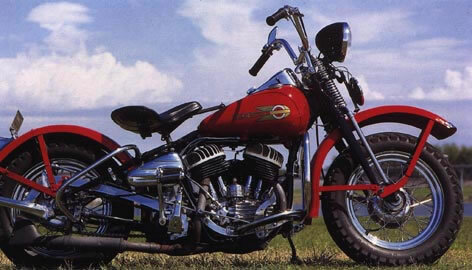 Harley Davidson introduced a telescopic fork to their 61 and 74 cubic inch twins during 1949, giving machines thus equipped the title Hydra-Glide, interestingly, the loss of Indian as a major rival and the combination of a sprung saddle, telescopic forks, long wheelbase and "balloon" tyres led Harley to dismiss the need for rear springing until 1958 and the introduction of the Duo-Glide series. 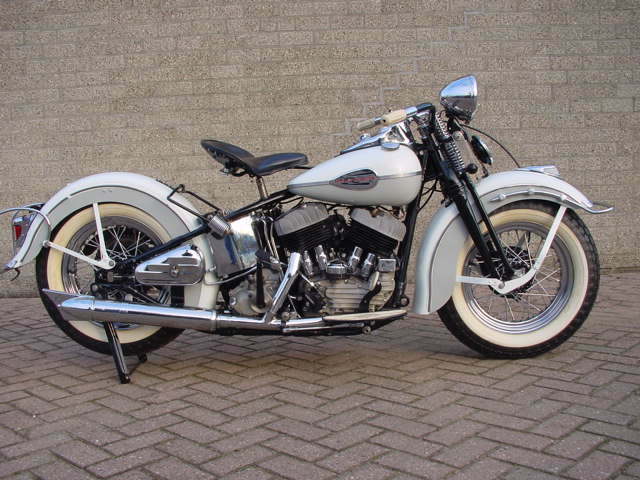 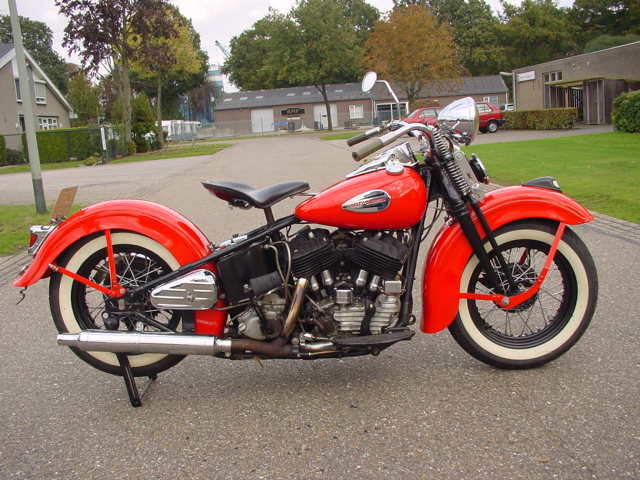 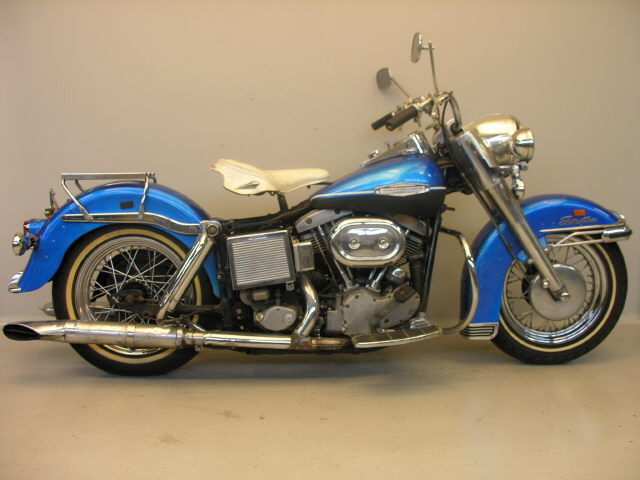 The Hydra-Glides are arguably the most attractive of Harley's post war tourers with clean flowing lines. 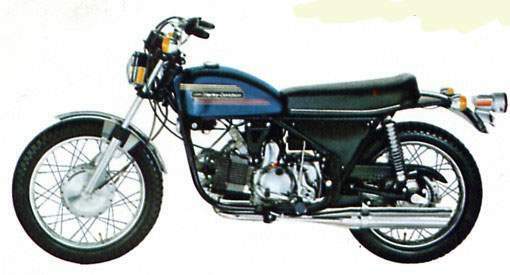 These are often mistaked for Hummers, but the Hummers are 125 cc. 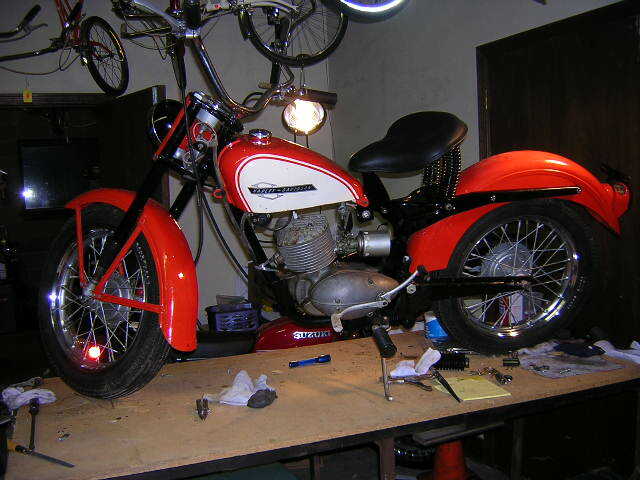 This is the big brother at 165 cc. 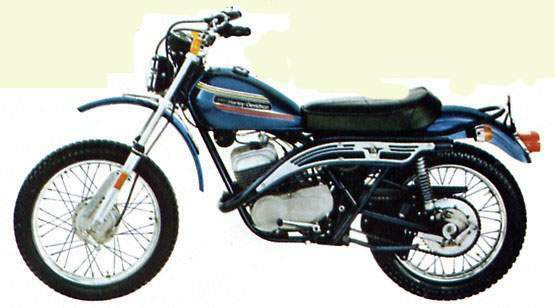 It is a two stroke hardtail motorcycle with a sprung saddle and front telescopic forks. 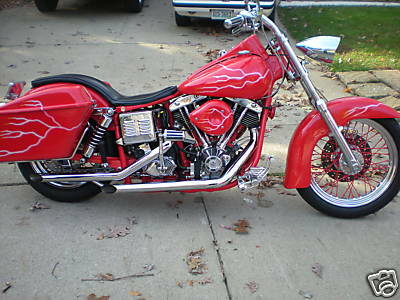 This bike has the optional Hi Fi red paint that is a metallic deep red. 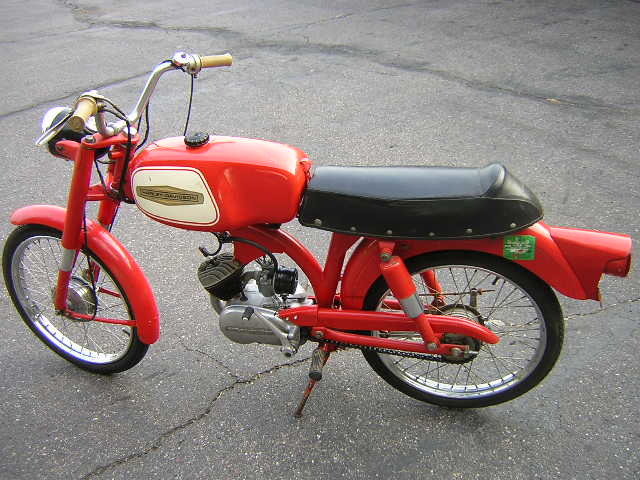 The wheel size is 18". 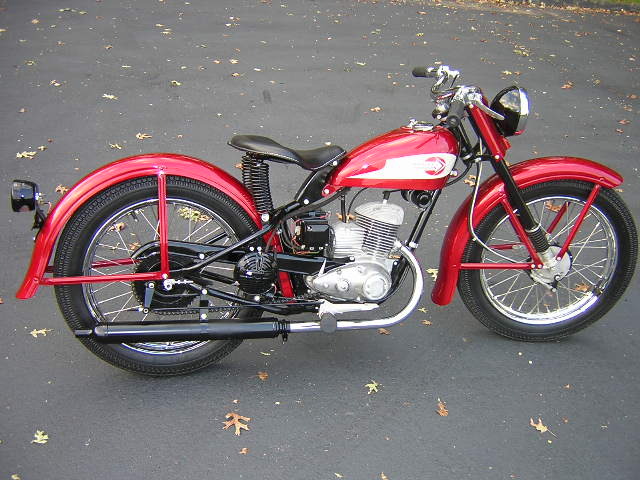 This bike is restored and everything on her is correct for the 1959 year. 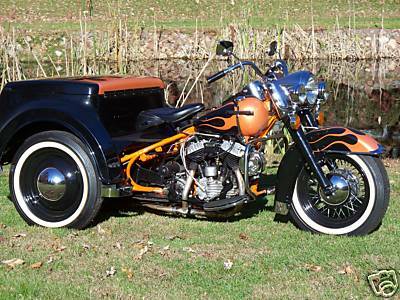 1960 Harley Davidson Topper Model A This is the only motor scooter that H-D ever produced in their 105+ year history. 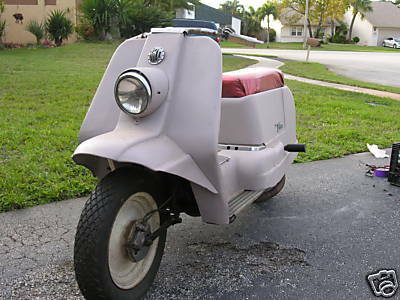 Only approximately 3,000 of these scooters were built during the model run from 1960 through 1965, and less than 100 are currently believed to remain worldwide. 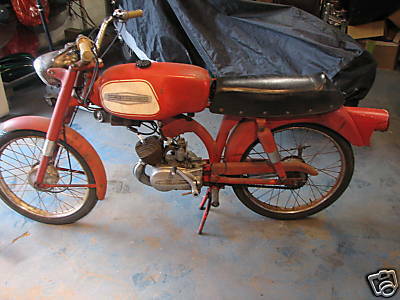 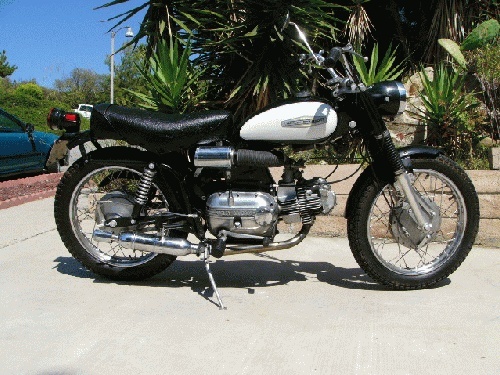 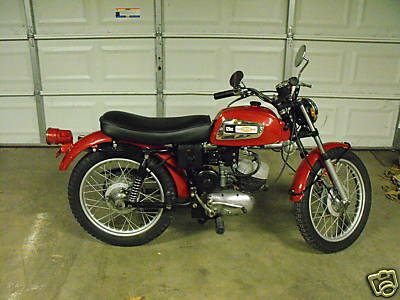 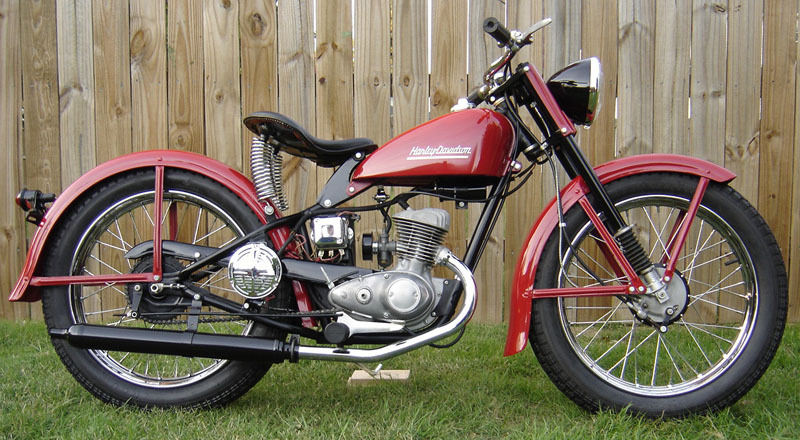 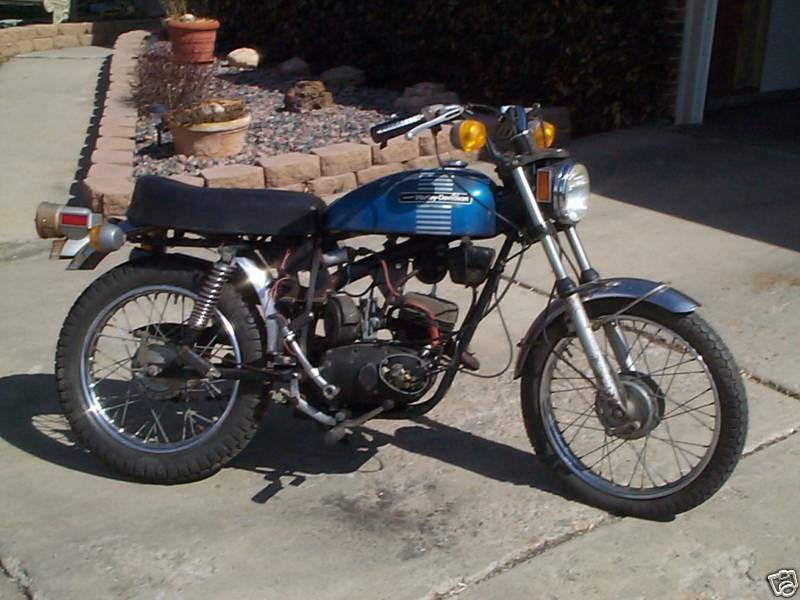 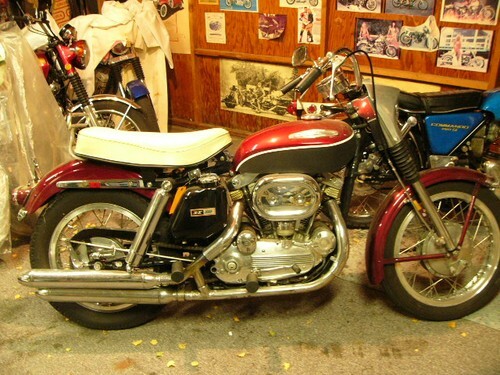 1962 Harley Davidson Ranger 165cc. 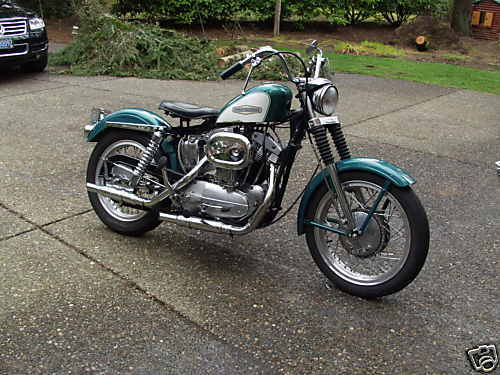 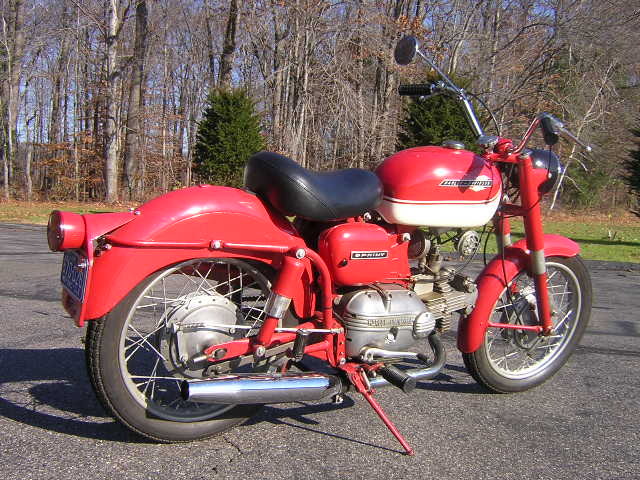 These bikes were only produced in 1962, 1 0f 182 made. 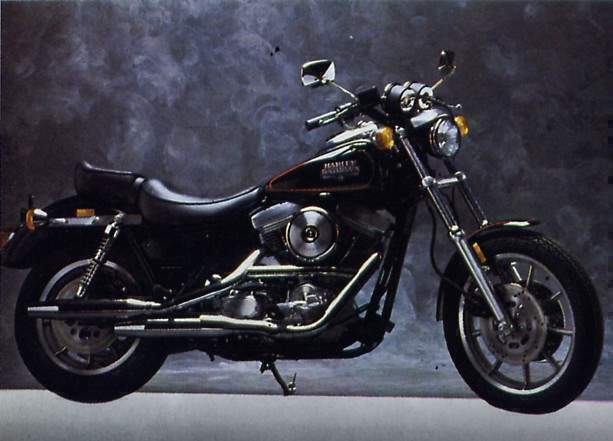 The Ranger was a stripped down version that came with no front fender, speedo, or lighting kit. 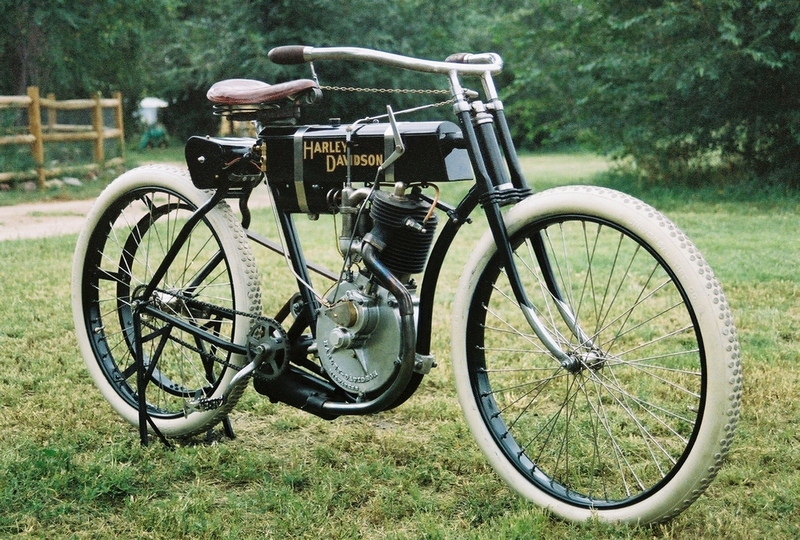 It has a 84-tooth rear sprocket, making the gear ratio very low. 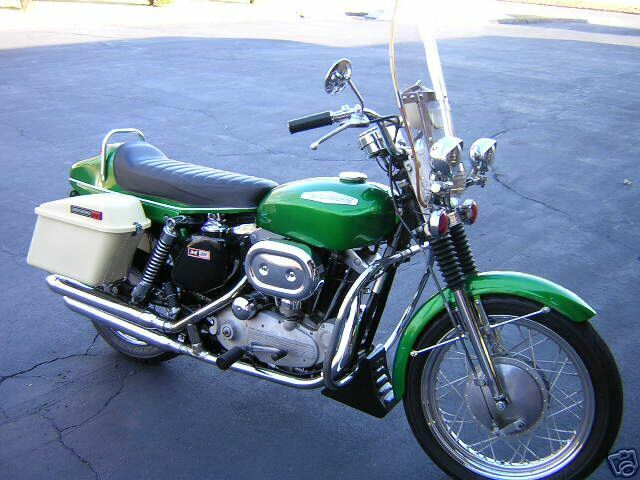 Again, this bike is a mint restoration, painted in Hi-Fi green. 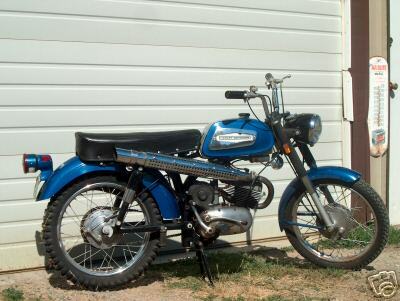 It also has the correct, very hard to find Goodyear Grasshopper front tire and the Continental Sport knobby rear tyre. 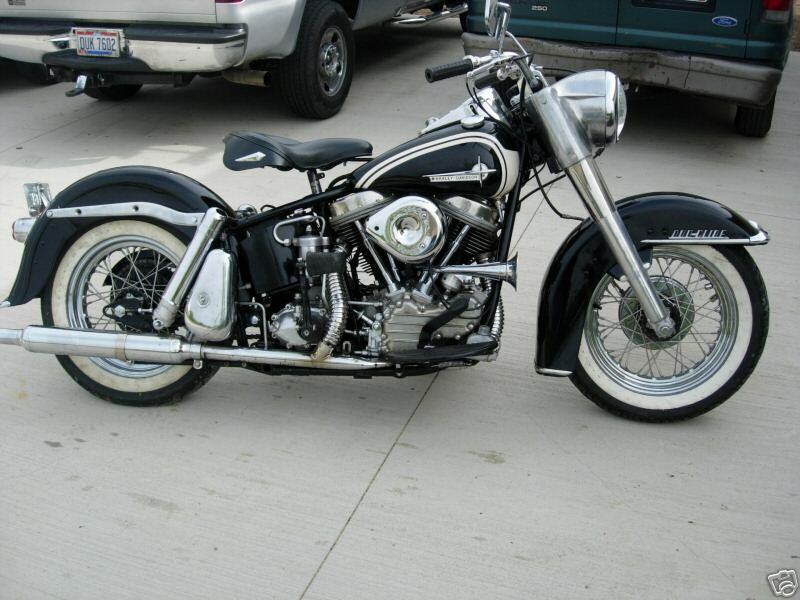 1963 Harley Davidson Hardtail Panhead motor and transmission. 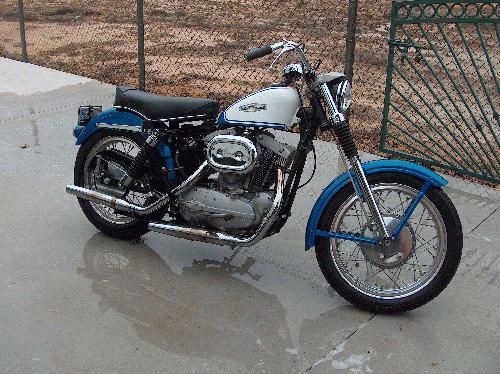 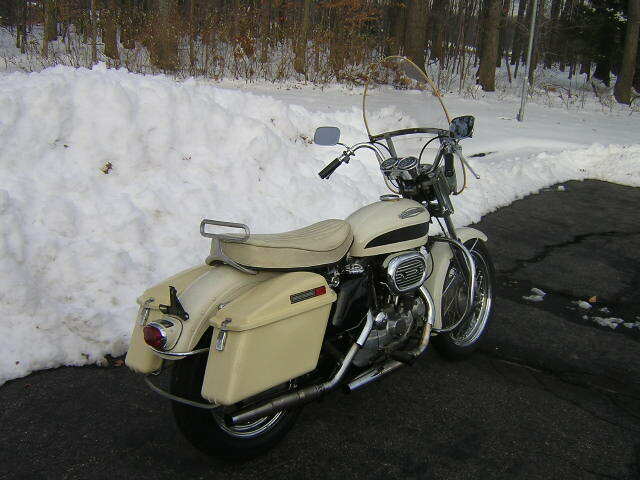 1970 Harley Davidson Touring Sportster Touring Sportster 900 Electric Start, HD bags, Blinkers, windshield, crash bars, 1970 only boat tail, grab rail and passing lamps. 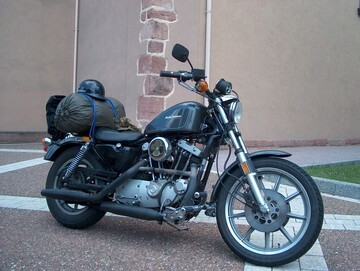 All decked out with factory options for the 4 gallon touring 900 XLH. 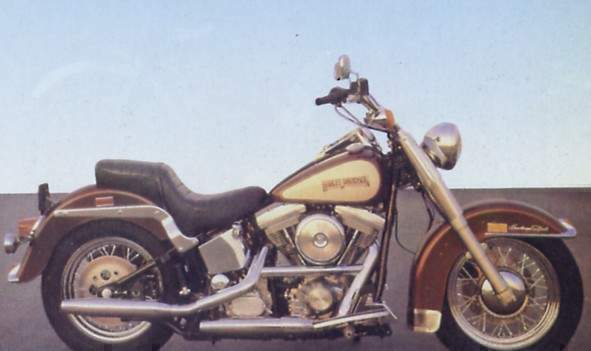 Classic is RARE with the fiberglass tail section made in the HD Tomahawk plant for this bike 1 year before the 1971 FX Superglide had one. 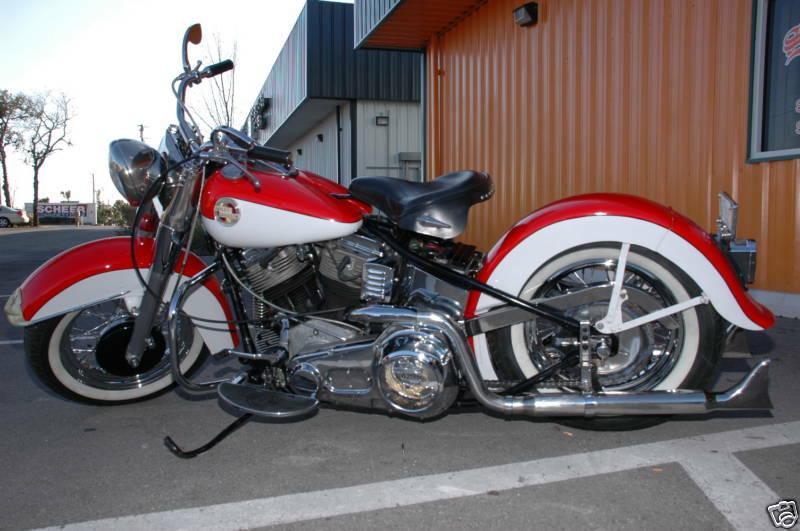 THIS bike is Willie G's first factory custom. 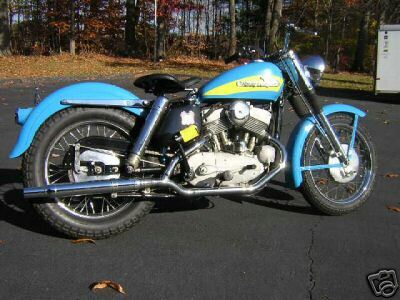 1974 Harley Sportster engine cases, primary cover, rocker housings. 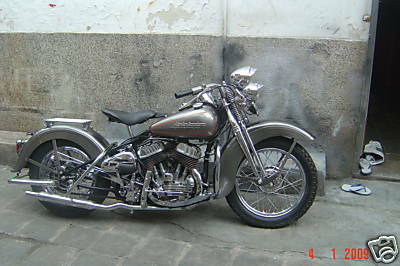 Polished chrome plating on oil tank, lower fork legs, head light and housings, rear brake housing and most all hardware. 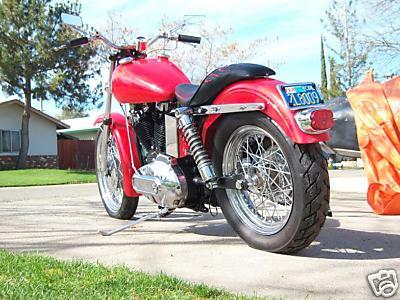 Billet front brake caliper and fuel petcock, drilled front disc, stainless braided brake line, progressive rear shocks, engine rebuilt to stock with Mikuni HS40 carburetor, KN air filter, staggered dual exhaust, dunlop tires, custom Danny Gray seat, electric start. 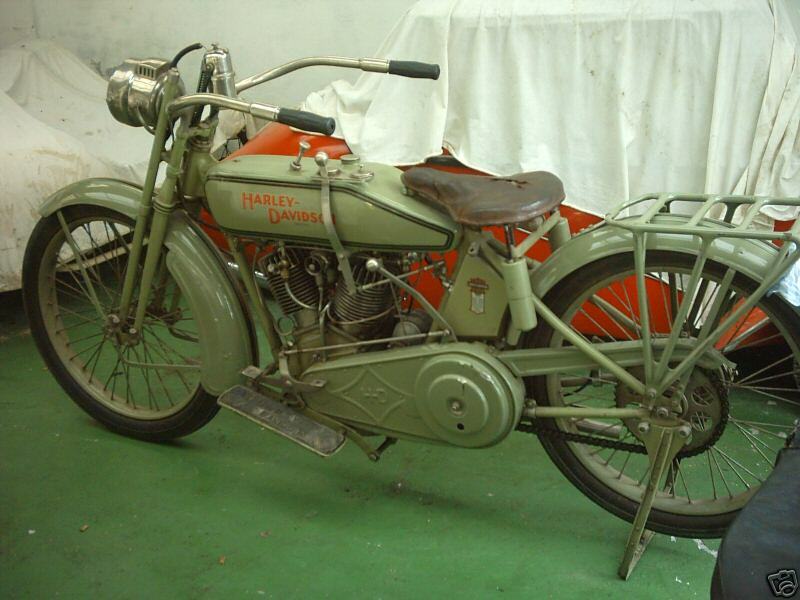 Harley Davidson M50 This little guy is a Harley Davidson M50. 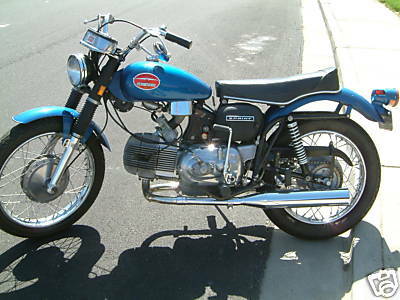 Made in Italy at the Aermacci plant it is a sporty 2 stroke that shifts through it's 3 grear by rotating the entire left grip and clutch lever assembly. 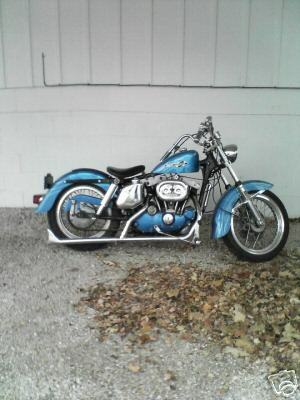 1976 Harley Davidson 1200 FXE Shovelhead The bike is a 4 speed, wide glide front end, 21" wheel, custom FL front and rear fenders, drag bars, recently replaced straight drag pipes, lowered progressive shocks, molded frame, kick and electric start, S&S carb. 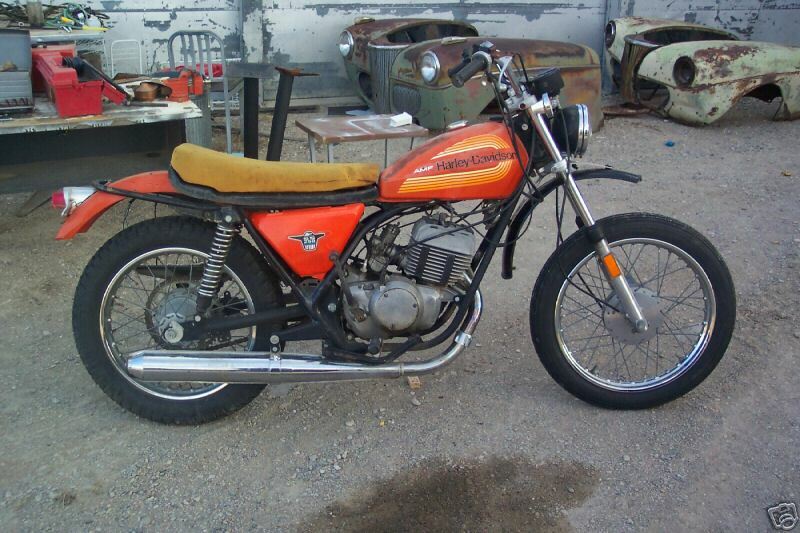 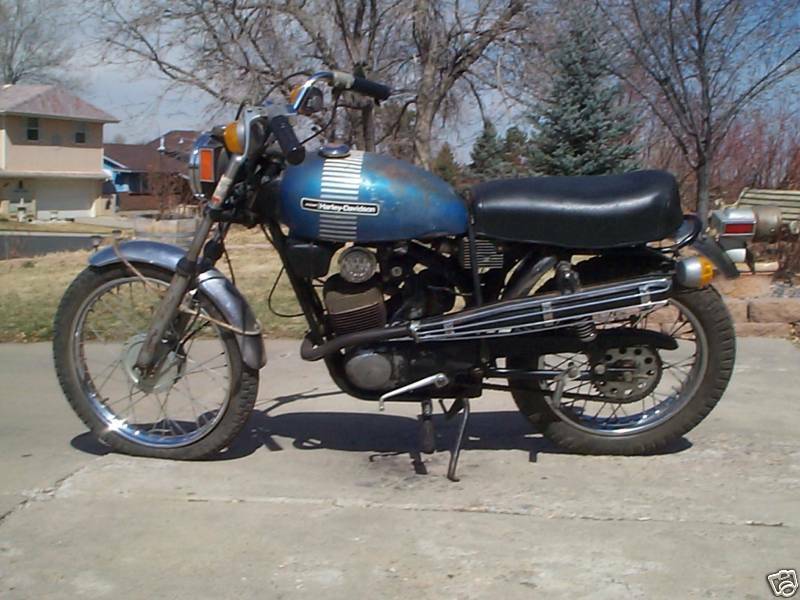 1978 Harley Davidson 250MX Featured here is a 1978 Harley Davidson 250MX. 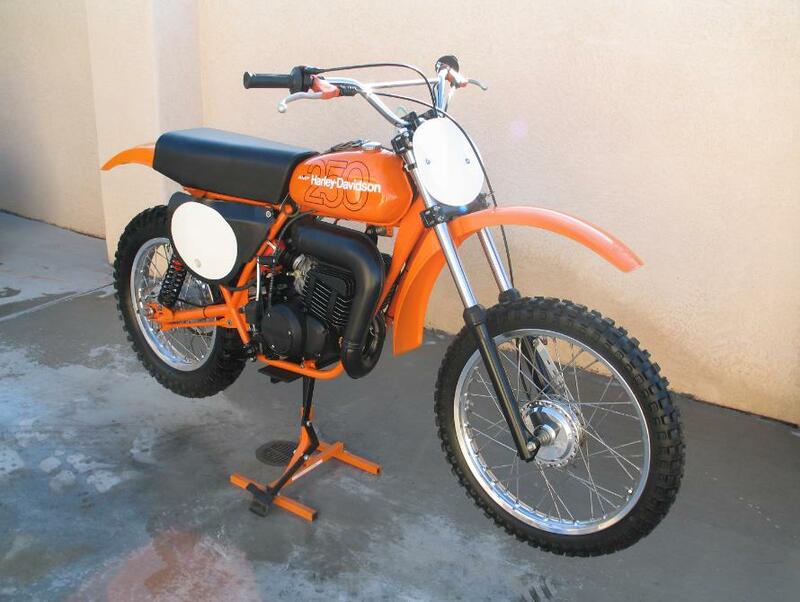 In the early to mid 1970's, Harley Davidson began development on a competitive motocross bike with the hopes of entering the lucrative dirtbike market. 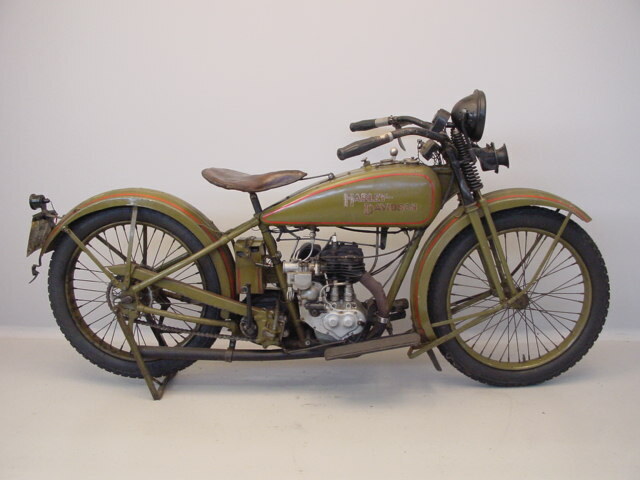 The early "works" bikes went through a lot of changes. 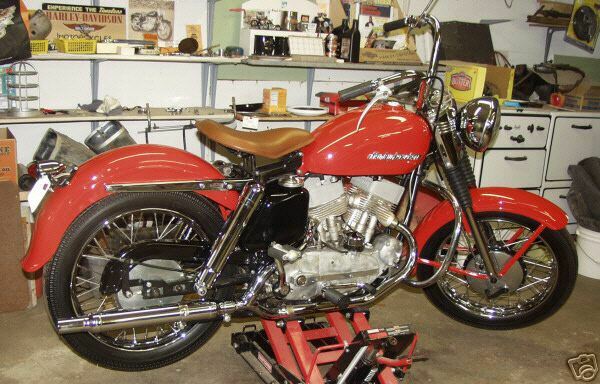 Marty Tripes and Rex Staten were the most recognizable pros to campaign these bikes at a professional level. 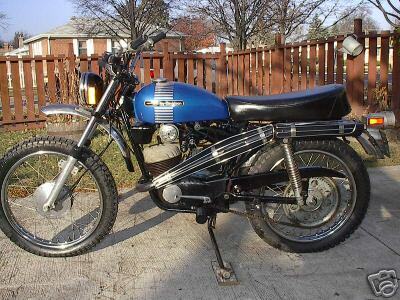 Tight budgets and a lack of commitment on behalf of Harley Davidson doomed their chances of a successful off road program. 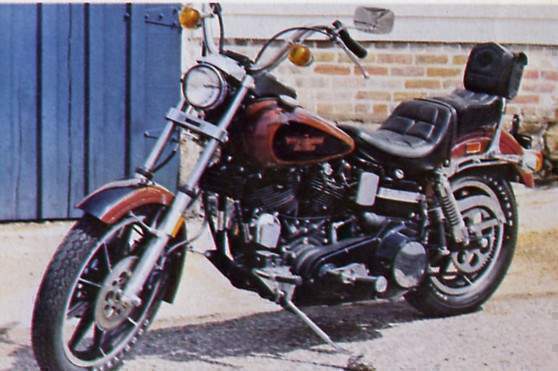 1978 Harley Davidson 250MX The 1978 Harley Davidson 250MX was the only production model produced and was greeted with great deal of scepticism by the American Consumer. 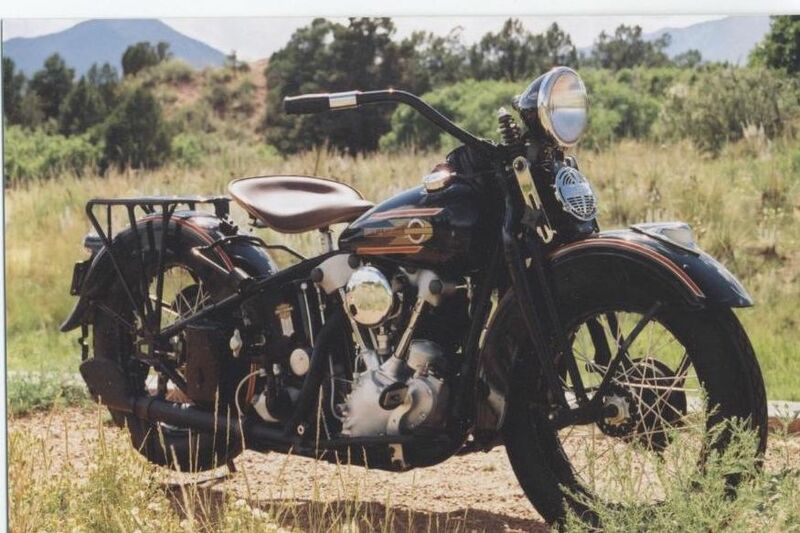 Very few were manufactured and they were never produced again. 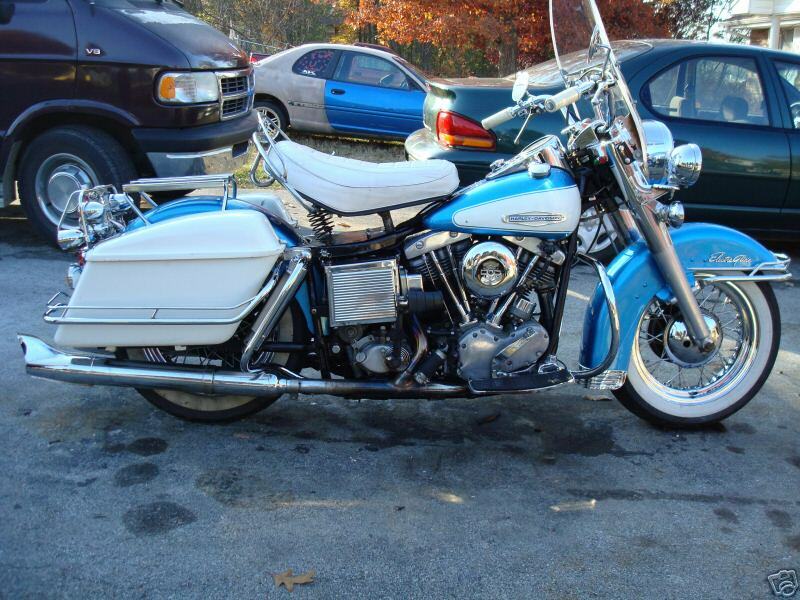 1978 Harley Davidson FL 1978 Harley-Davidson FL with a shovelhead motor, electric/kickstart, dual spark plug heads/ignition, S & S oil pump, S & S "Super B" carburetor, chrome swingarm, 4 quart capacity chrome horseshoe oil tank, braided stainless oil/brake lines, LePera solo seat dovetail rear fender, 21" front tire, wide-glide front end, Wilwood rear brake caliper, detachable windshield, new paint, new clutch. 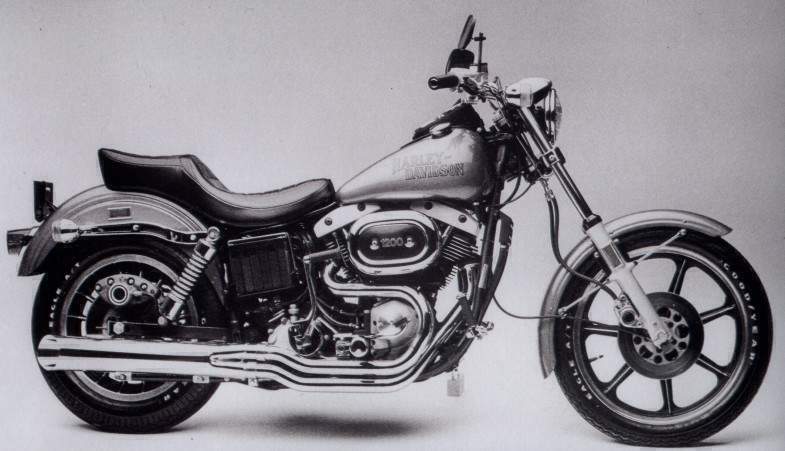 The FXS Low Rider's low-slung idle, flat drag-bars, and cast wheels formed perfect combination of style and function, it would become the second most produced model for 1978. 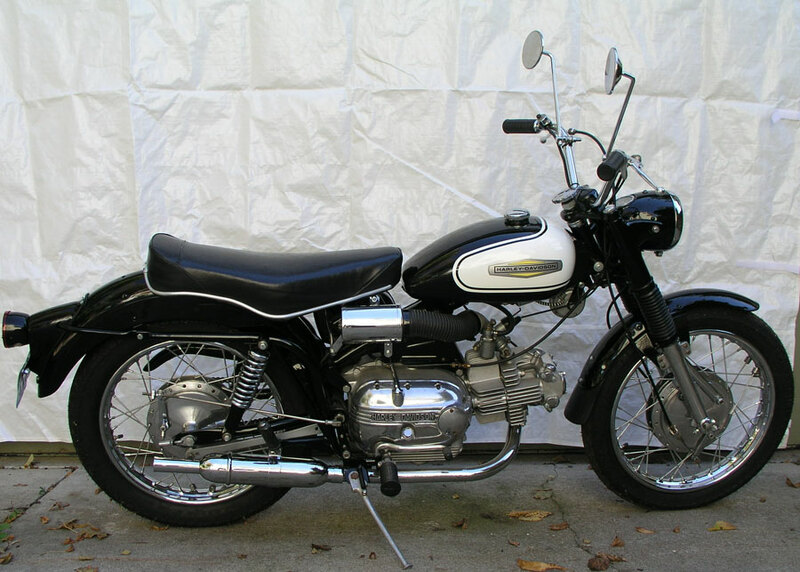 While the 1977 editions were sold in only the gray paint with red tank trim, the 1978 could be had with a contrasting two-tone scheme of black and silver. 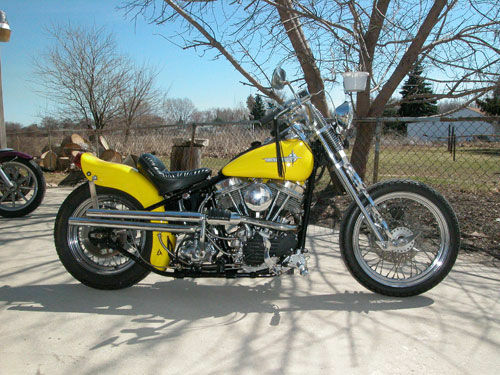 Improvements to the valve train were implemented in the middle of 1978. 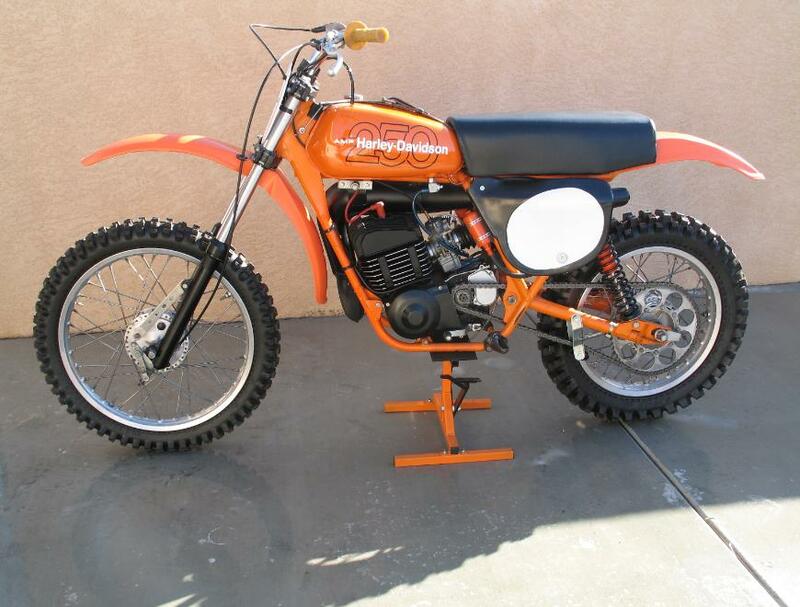 1979 Harley Davidson SST250 295kg. 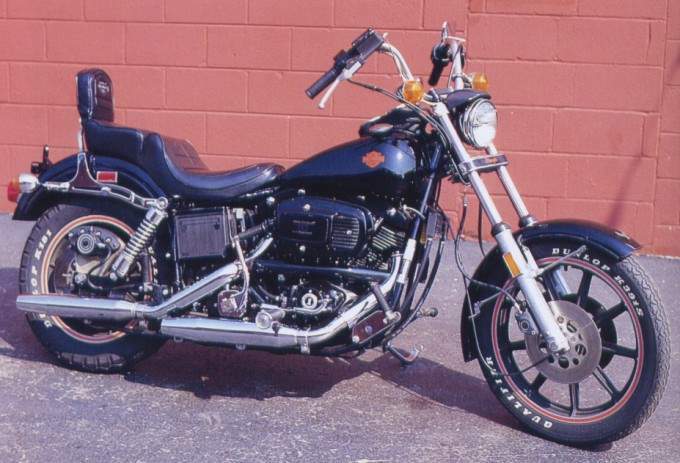 The entire line of Harley motorcycles, including the new FLT, received an improved electronic ignition. 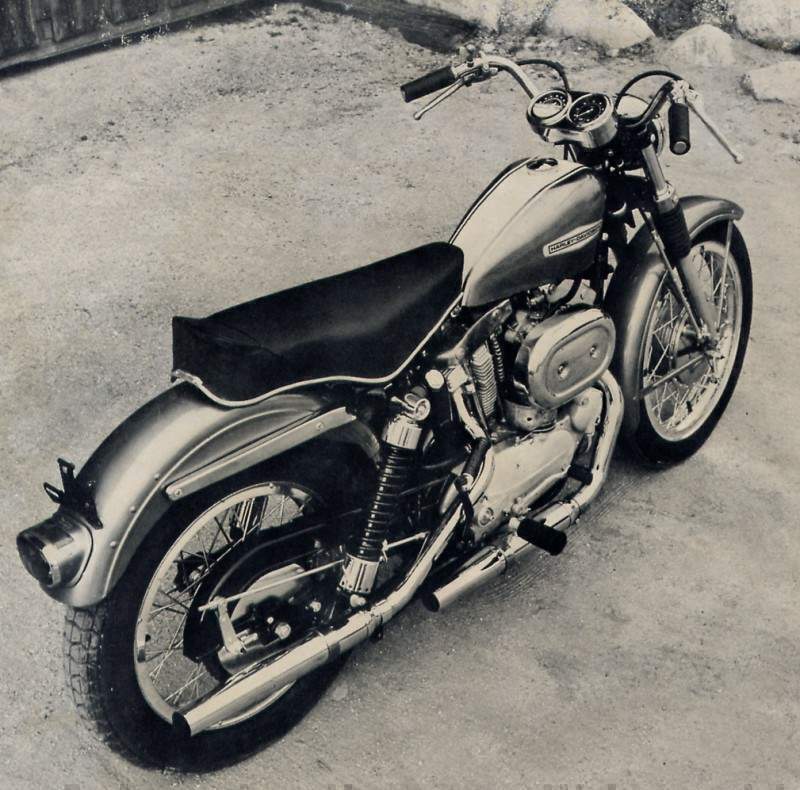 The big twin model was built on an all-new frame that included compressible motor mounts to reduce vibration felt by the rider. 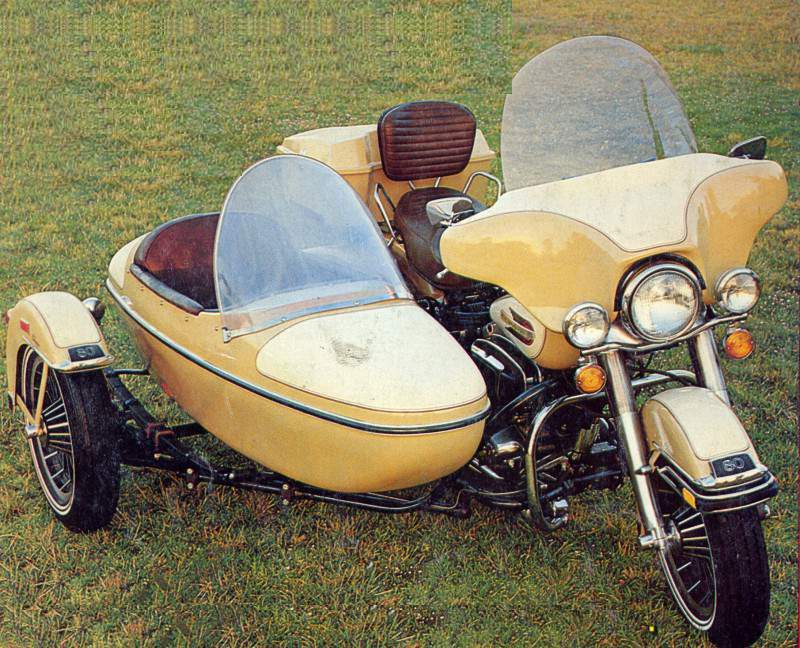 A frame-mounted fairing held a pair of round headlights behind the domed cover. 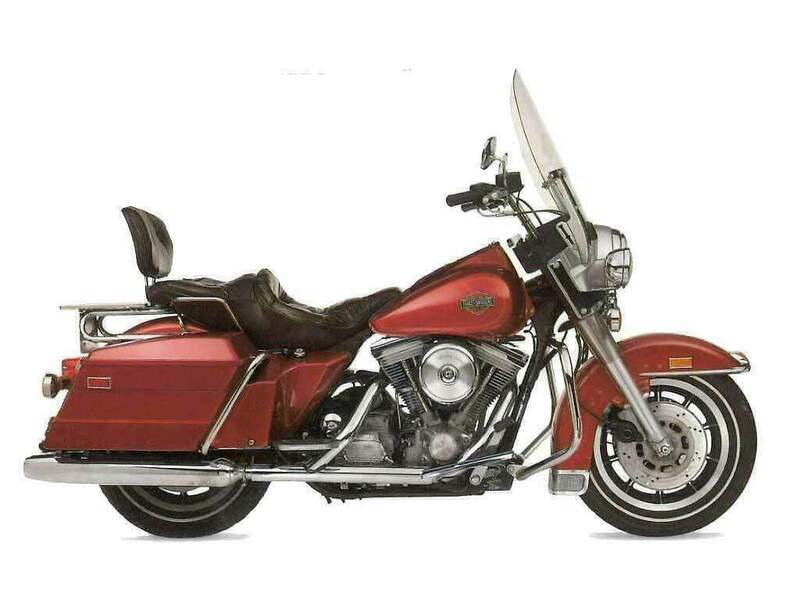 The new FLT weighed in at 725 pounds before fluids were added. 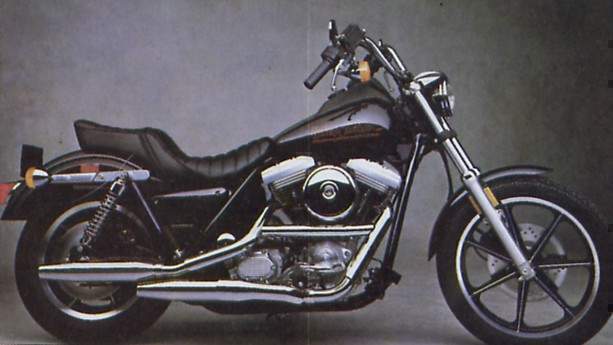 In 1981, the Motor Company was sold back to those who truly cared about the product, not just producing as many units as possible. 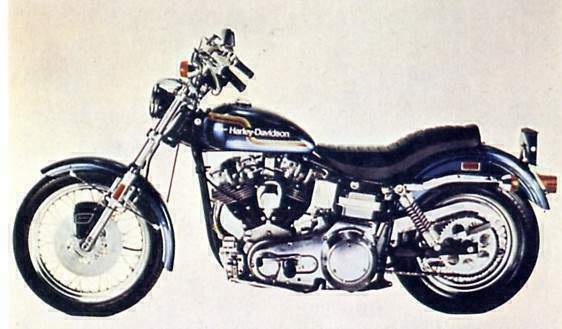 Not only did the management team remove AMF from the letterhead, but also pulled the 74inch Shovelhead motor from the option sheet. 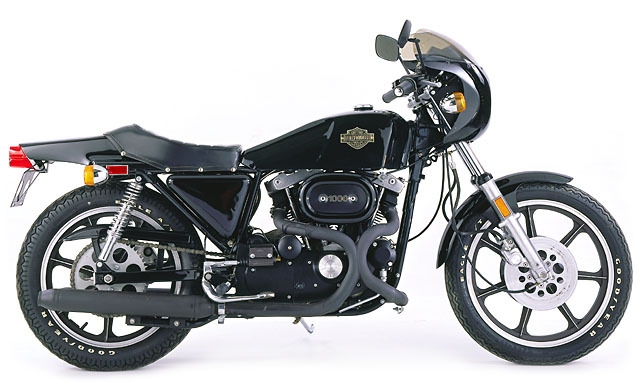 Creating a special model to commemorate the annual pilgrimage to the Black Hills in South Dakota, the FXB Sturgis served the Motor Company well. 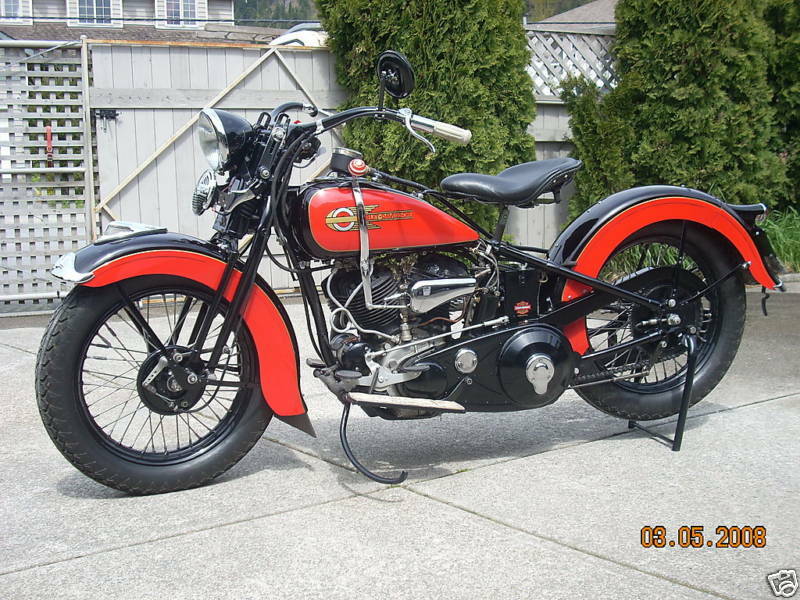 The classic black paint with red trim seemed timeless and a perfect tip of the hat to the rally. 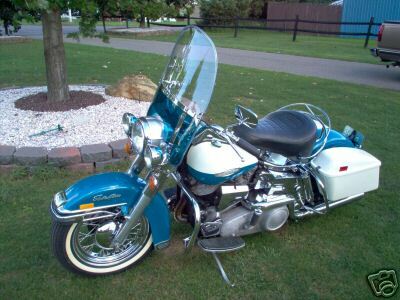 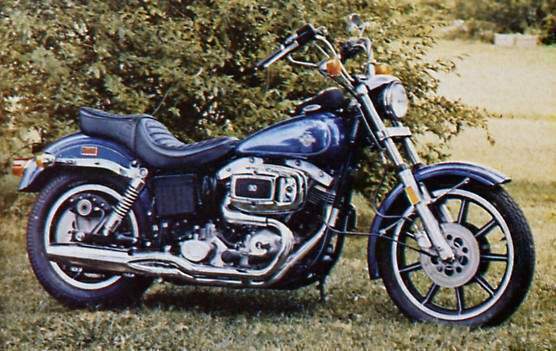 The dual-belt design was still in use on the 1982 models, and had proven itself a durable option to the chain drive still in use on most other motorcycles. 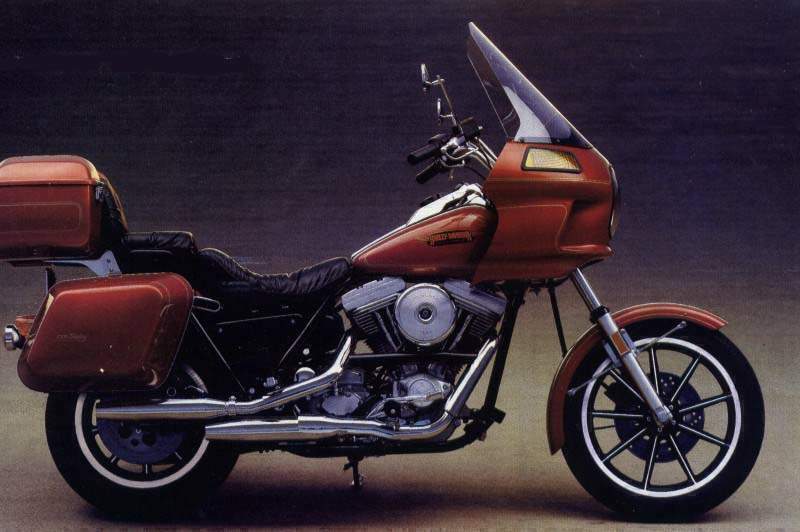 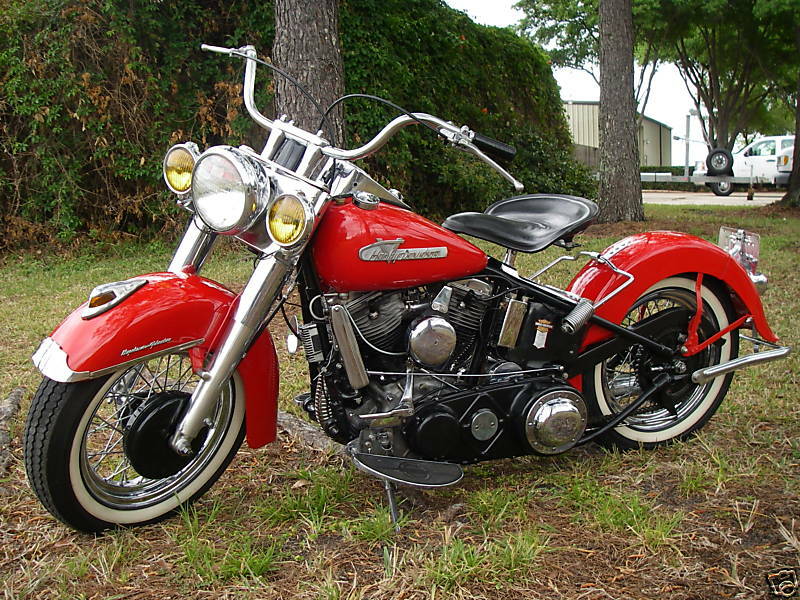 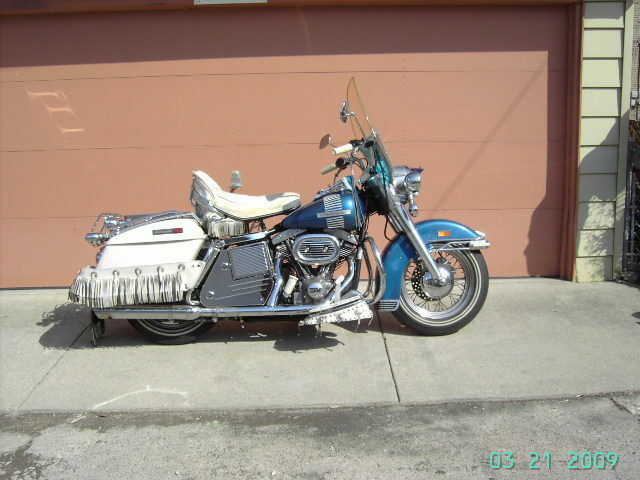 All good things must end, and 1982 was to be the final year for the FXB Sturgis model. 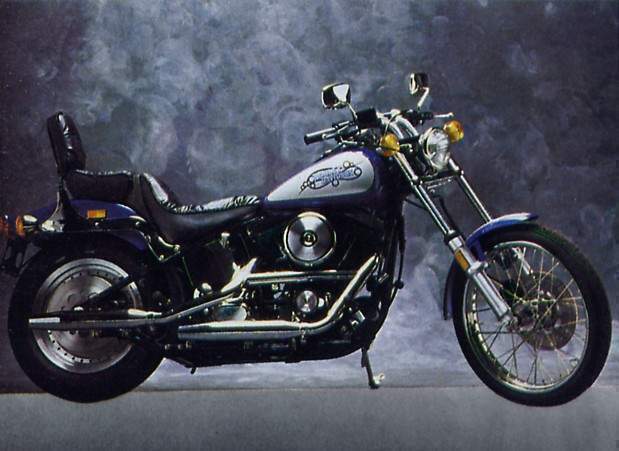 Not gone forever, it would reappear in the 1990s. 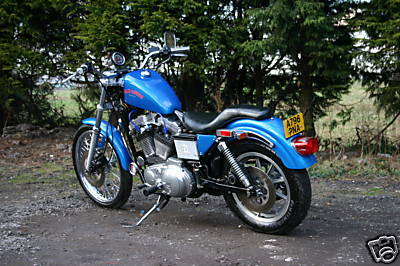 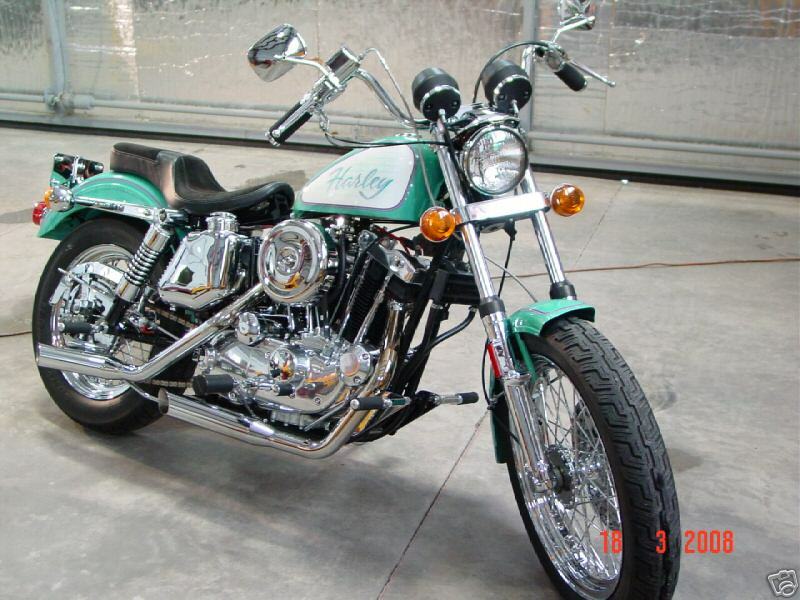 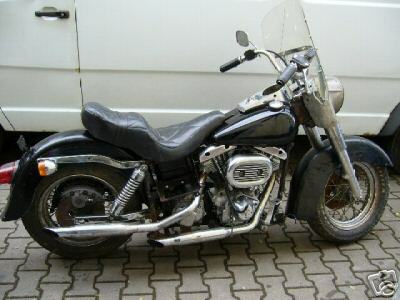 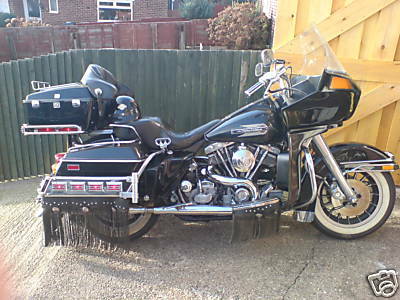 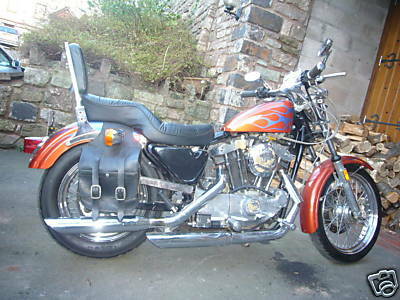 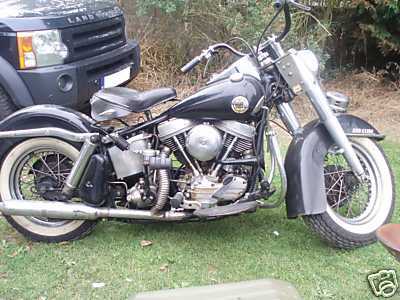 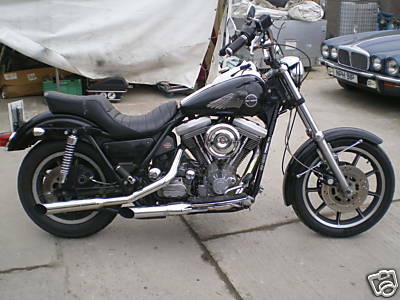 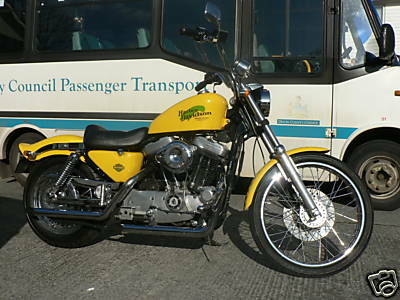 1983 Harley Davidson XLX-61 997cc, 230kg. 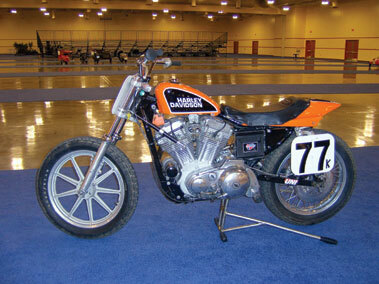 Flat track racing has inevitably been viewed as Harley Davidson's domain, with the company achieving a succession of "number 1" plates over the years. 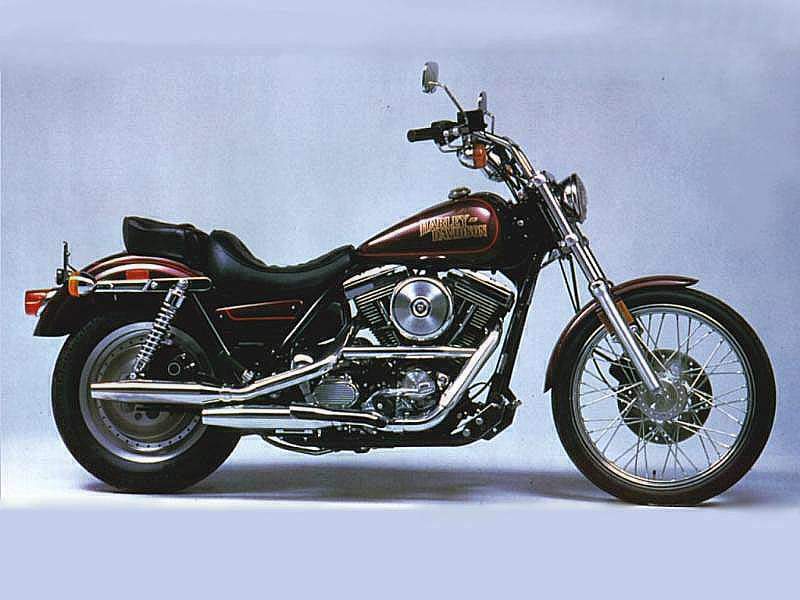 When foreign machinery has threatened to brake the Harley dominance the sports governing body has interceded with rule changes designed to restore the American products advantage. 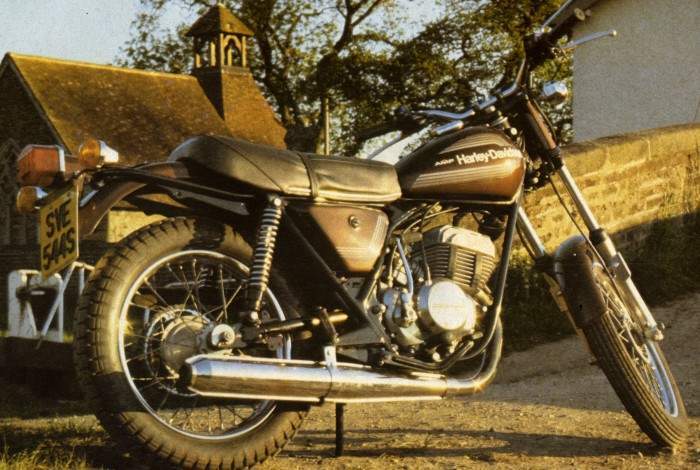 In recent years Honda have posed the greatest threat until rule changes effectively forced their withdrawal form the sport. 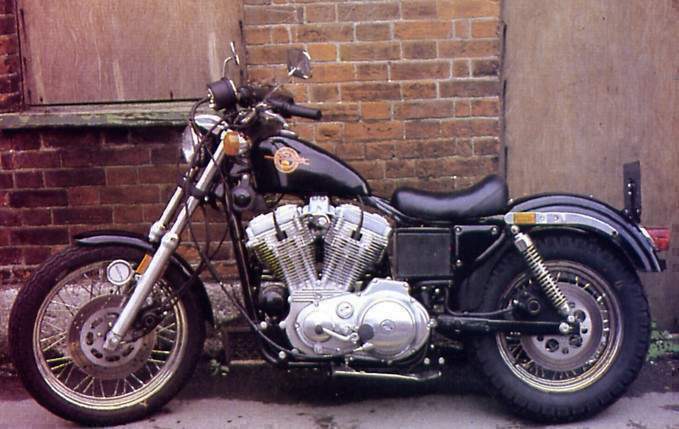 The RS883 followed continued the tradition established by the XR750. 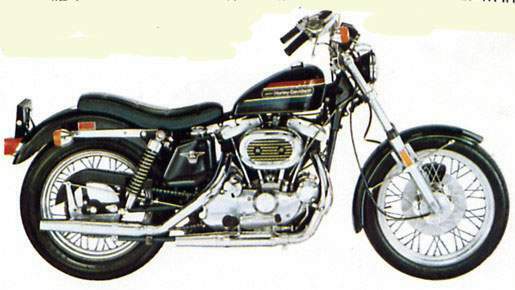 Derived from the road going Sportster, the engine was housed in a special frame equipped with purpose designed suspension. 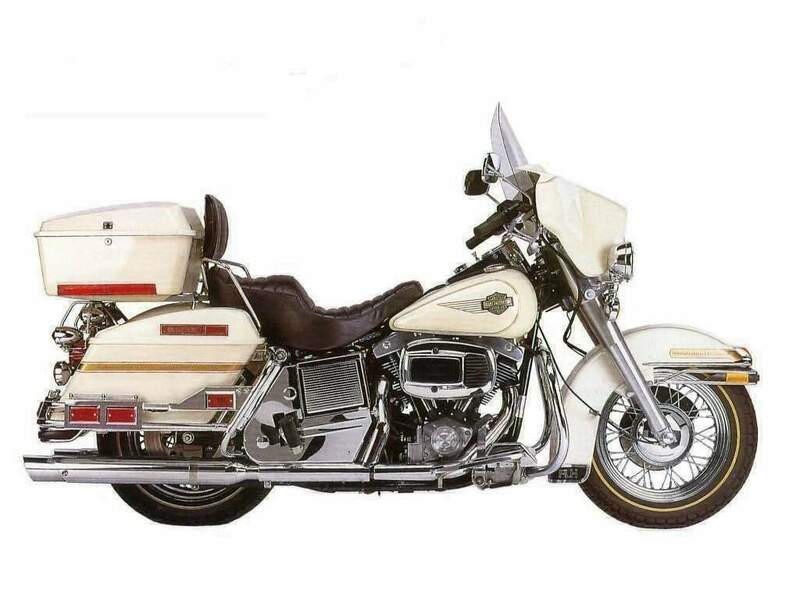 The 1988 Harley-Davidson FLHTC Electra Glide Classic was built to commemorate the company’s 85th anniversary. 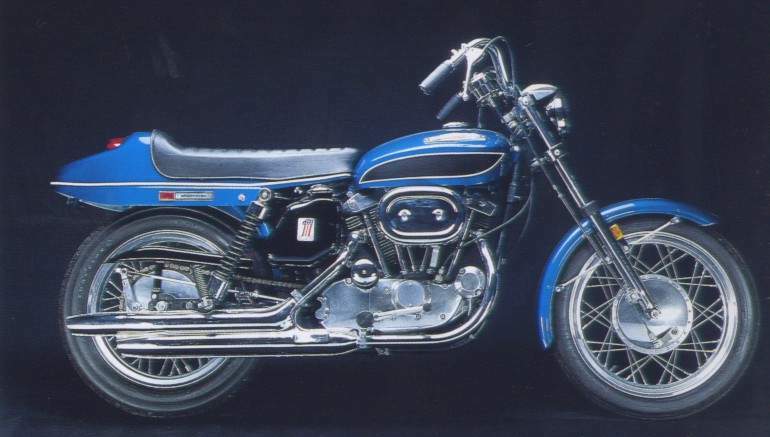 On the surface, that may not sound like a terribly significant milestone. 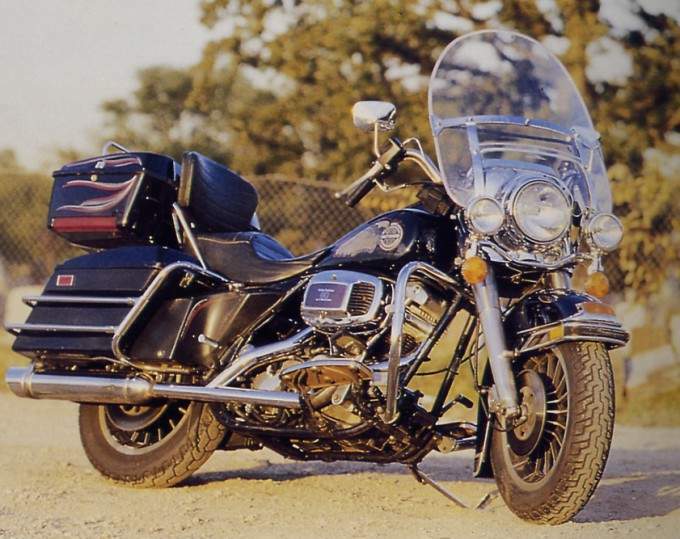 But in fact, it may have been the company’s most important anniversary - ranking ahead of 2003's gala 100th anniversary celebration.